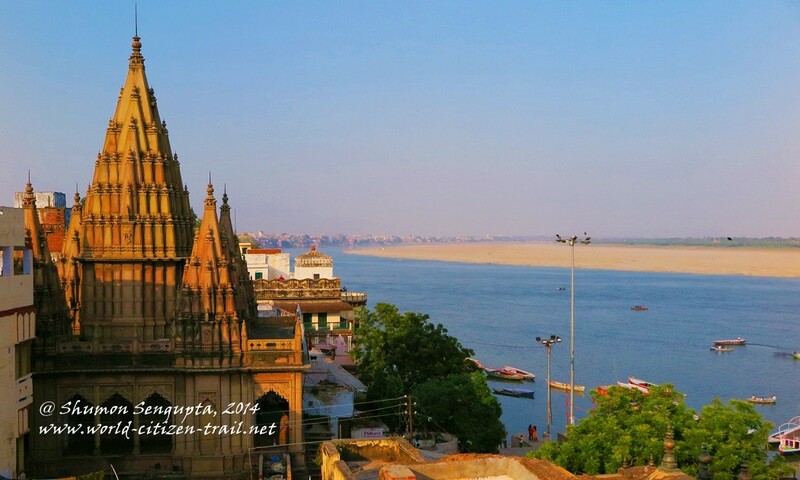 “Banaras is older than history, older than tradition, older even than legend and looks twice as old as all of them put together”, wrote Mark Twain, during a visit to the city in 1895. 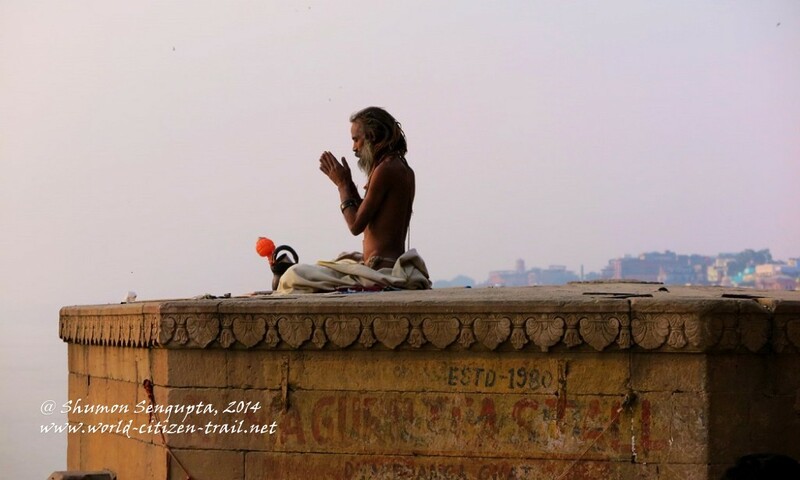 And he couldn’t have said it better. 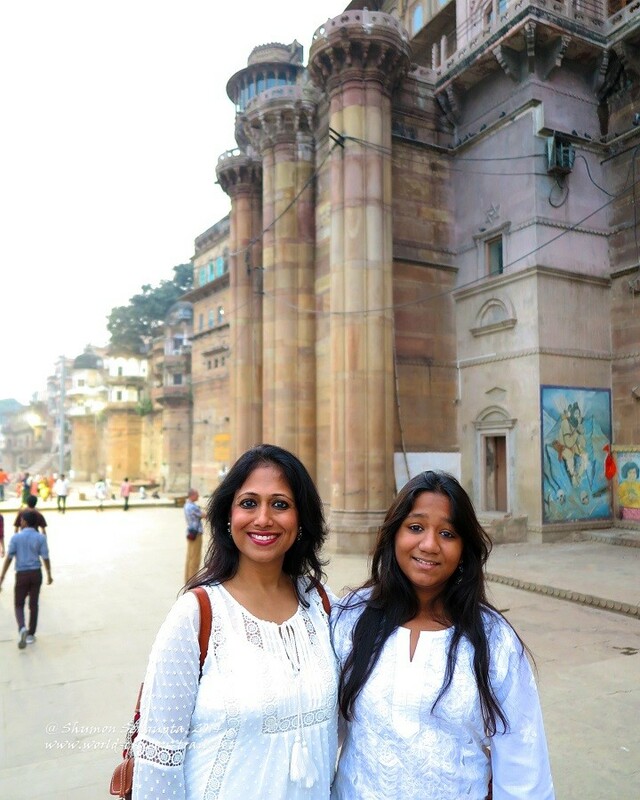 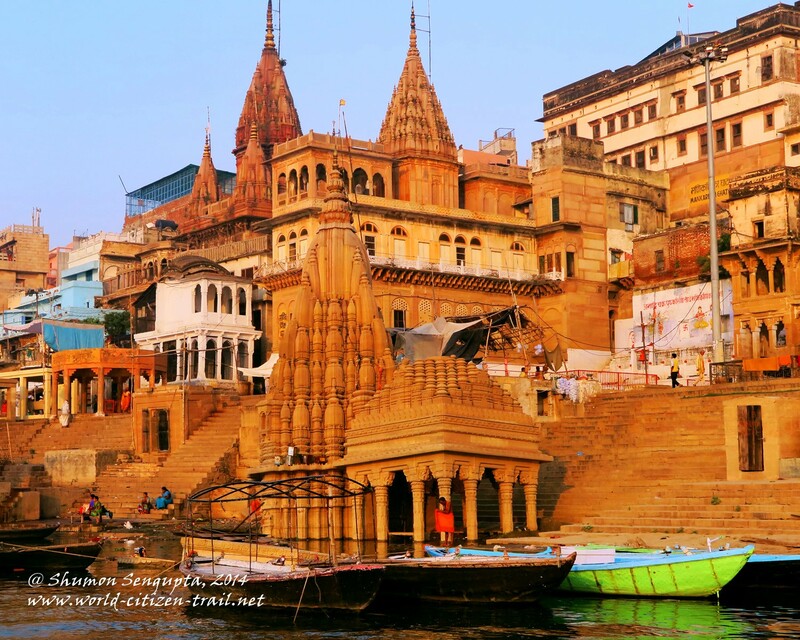 Cradled by River Ganges, Varanasi (or Banaras), with its numerous temples and shrines, is an ancient center of Hindu culture and spirituality. 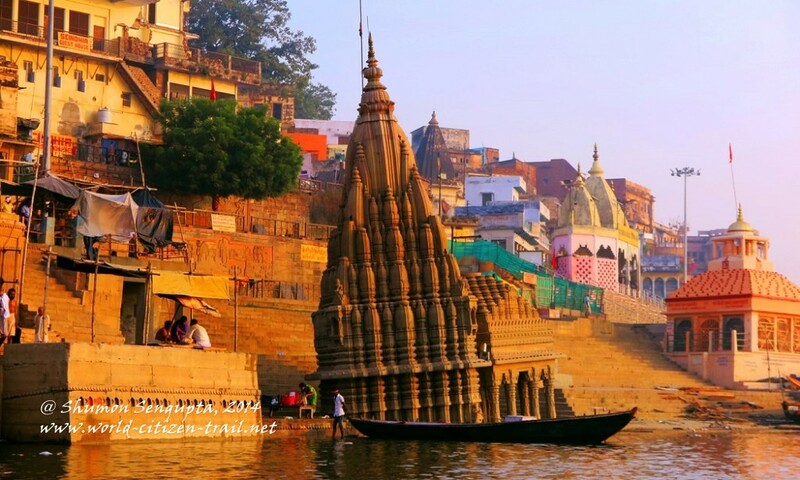 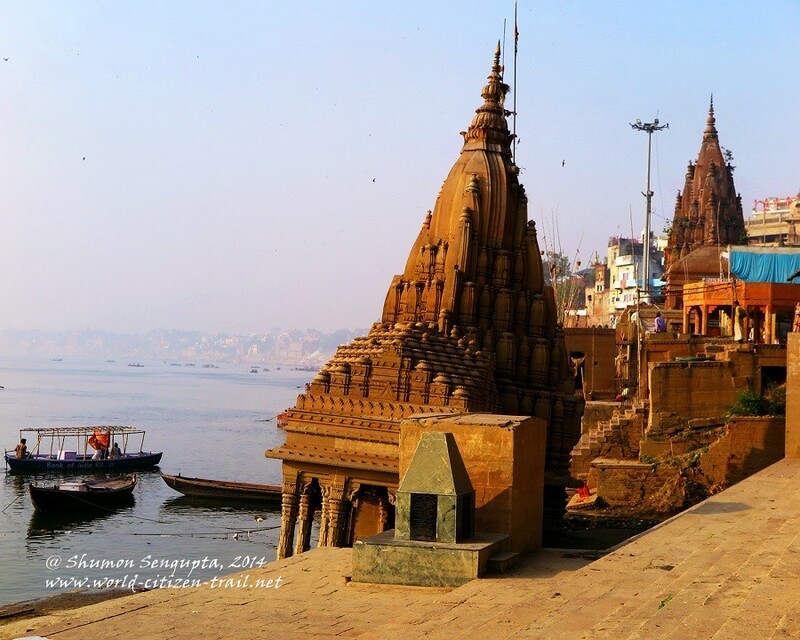 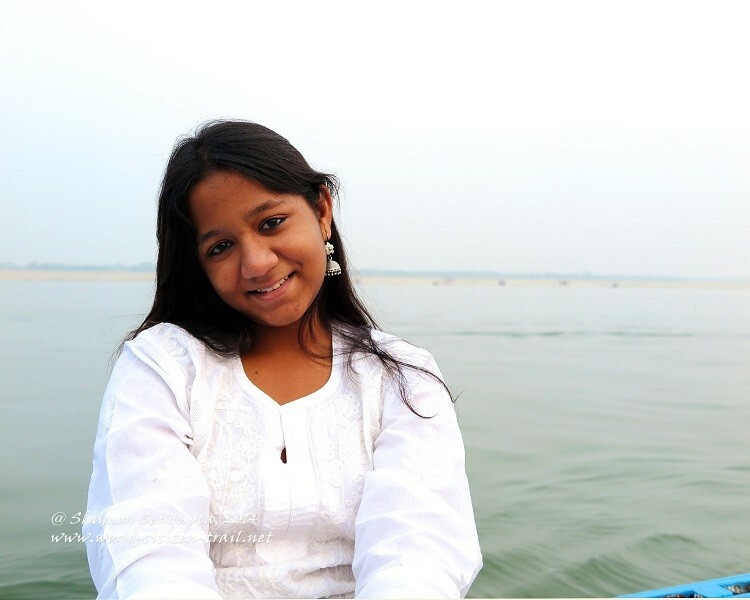 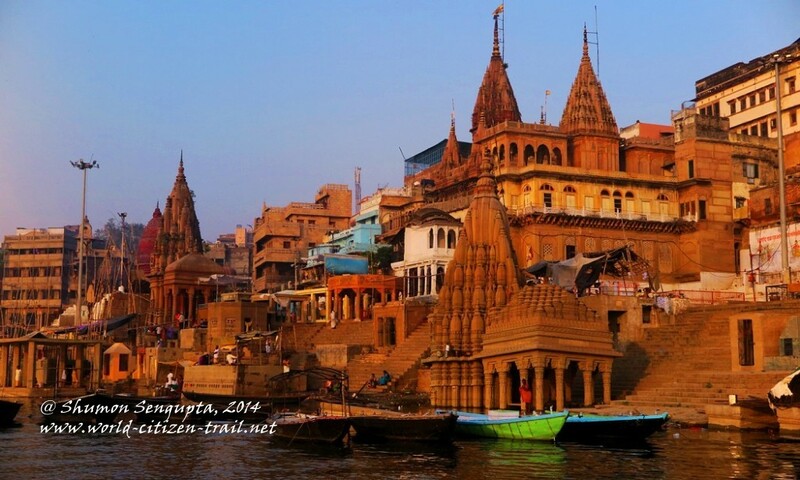 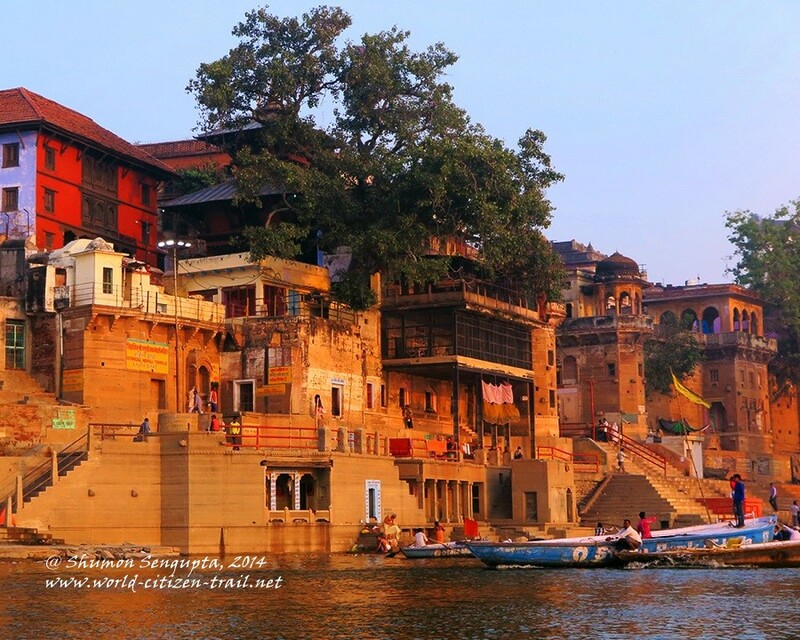 River Ganges is by itself considered as a ‘mother goddess’ by Hindus and has many temples dedicated to her in this city. 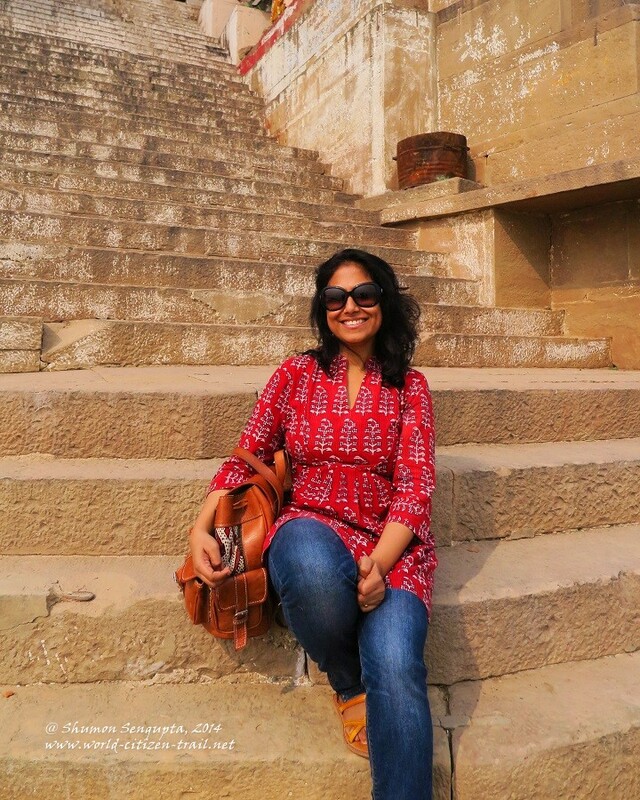 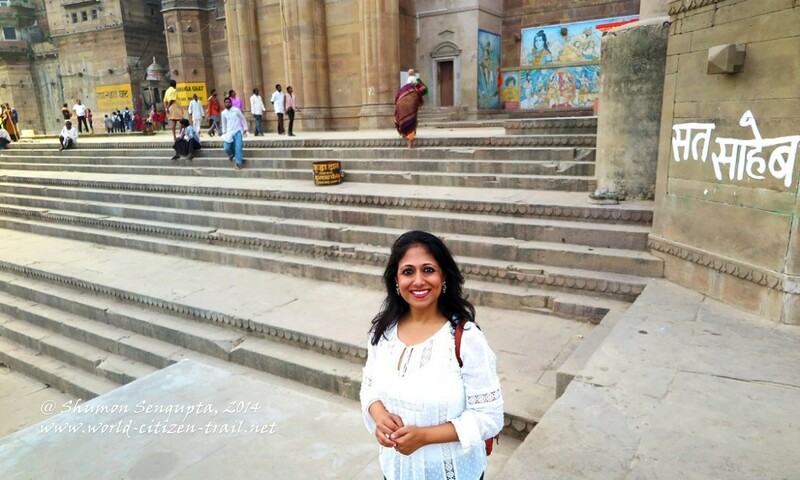 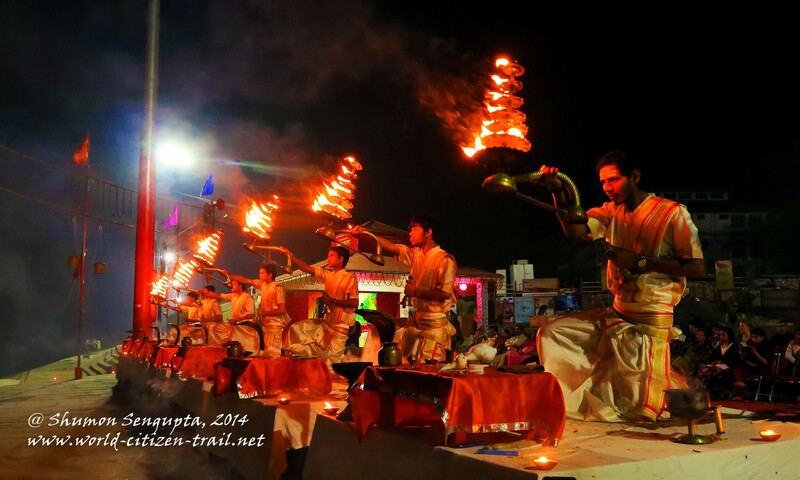 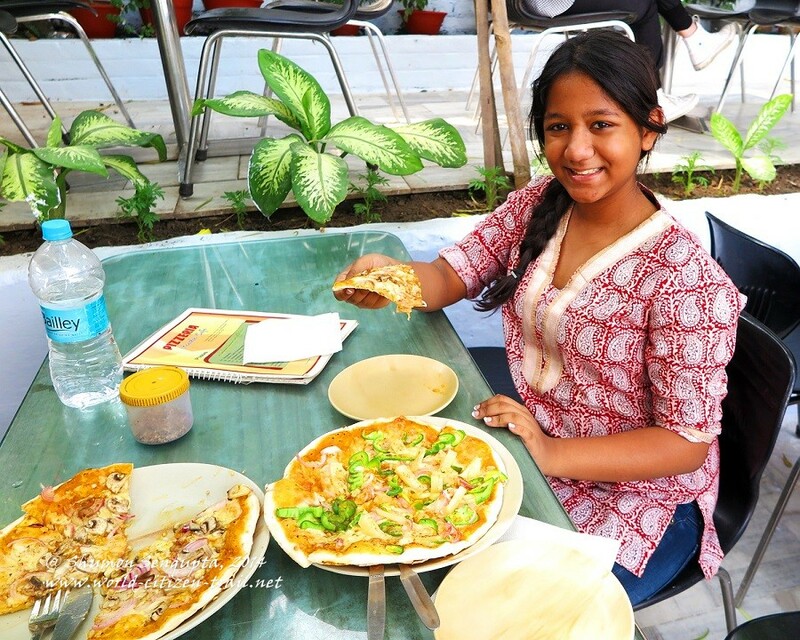 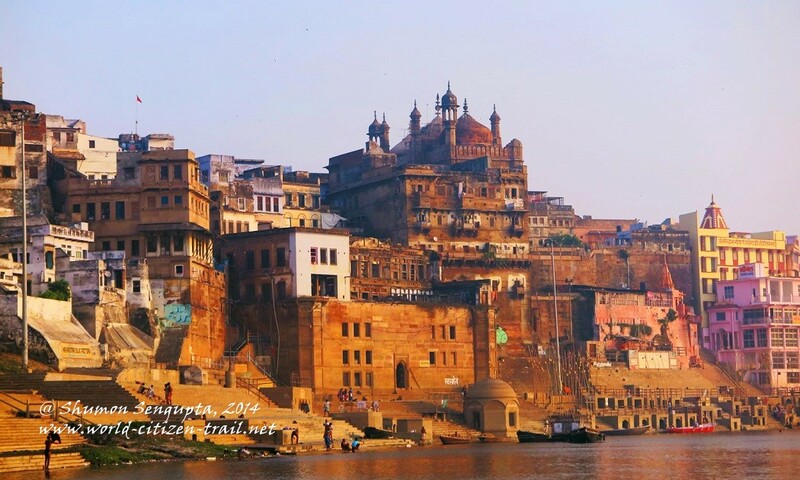 Varanasi is also one of the oldest continuously lived in cities in the world – it is said that around 500 BCE when Buddha was born, Varanasi (then known as Kashi) was already an ancient and thriving settlement. 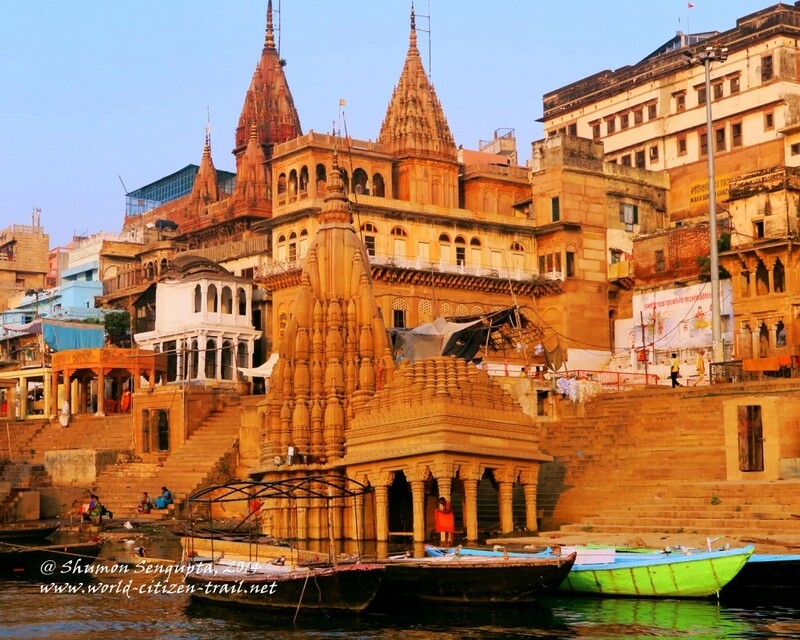 Along its entire north-south course of 2,520 kilometers originating in the high glaciers of the Himalayas in North India and ending in the Bay of Bengal in the East, it is in Varanasi that the Ganges takes a broad sweep, forming a dramatic crescent, flowing in the reverse northern direction for a short stretch of about 7 kilometers. 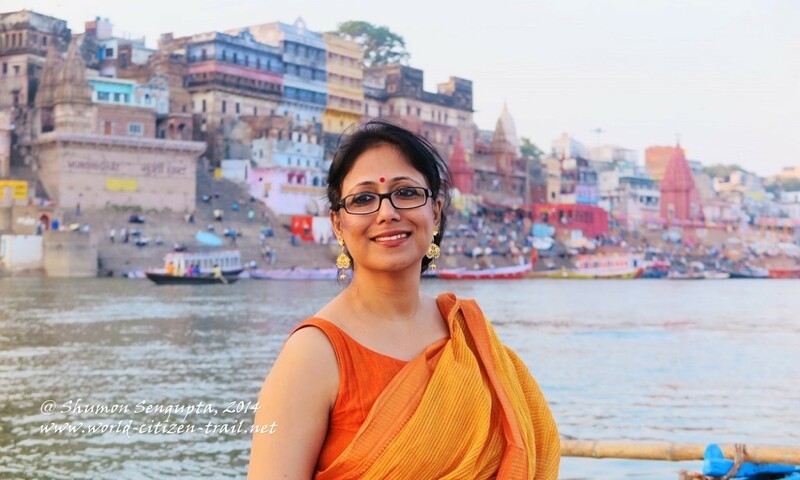 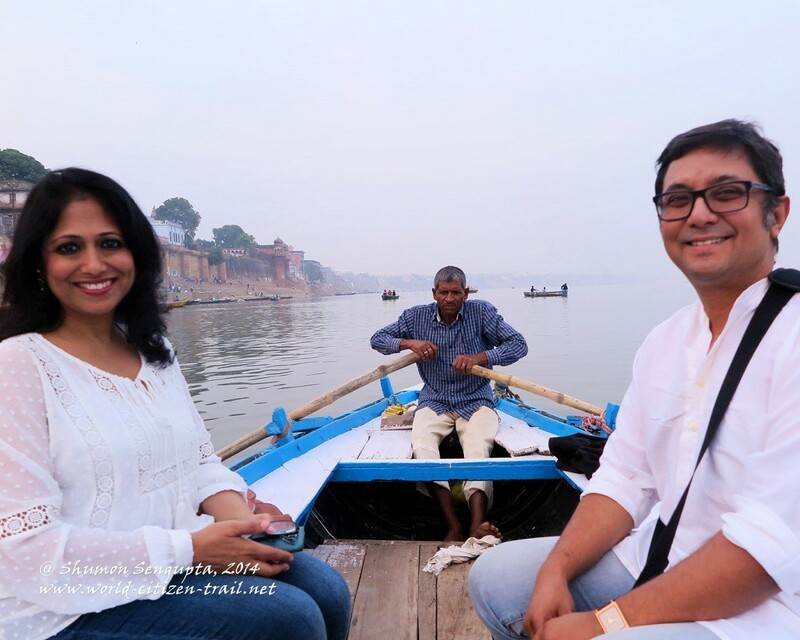 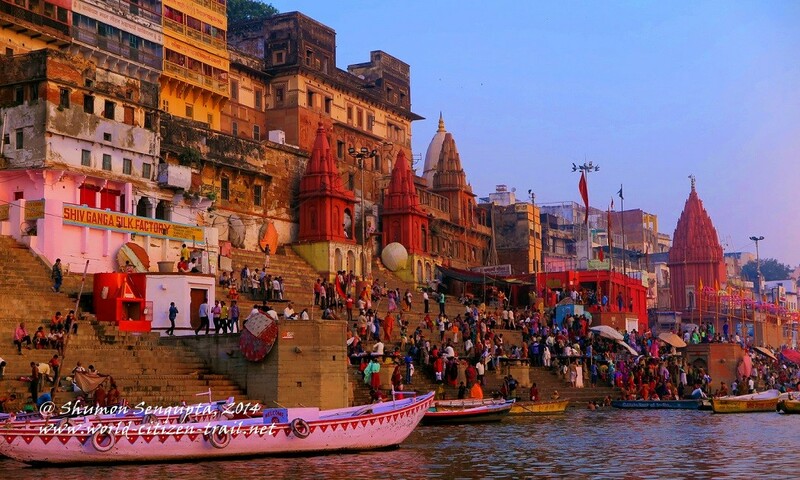 And it is on the left-bank of this crescent that we find one of the grandest cultural, religious and architectural spectacles of India – the magnificent riverfront of Varanasi. 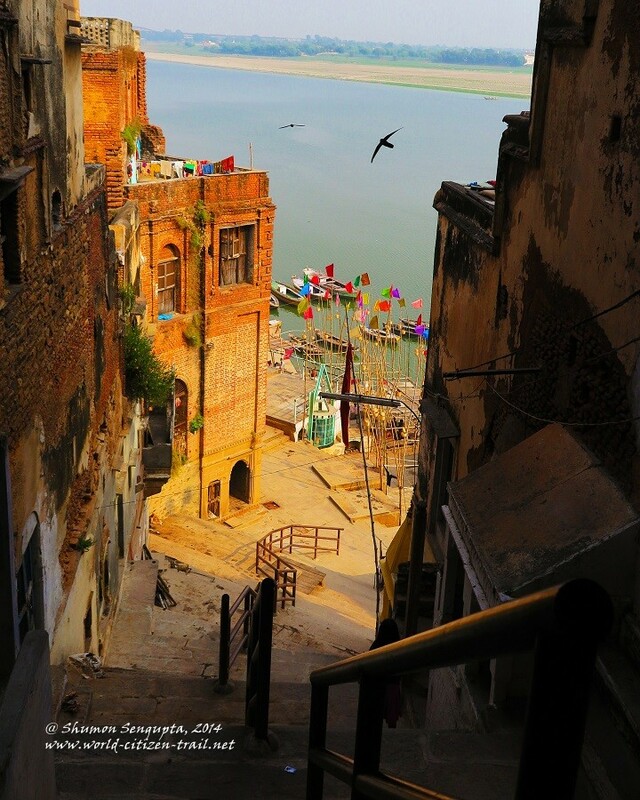 The opposite bank, i.e. 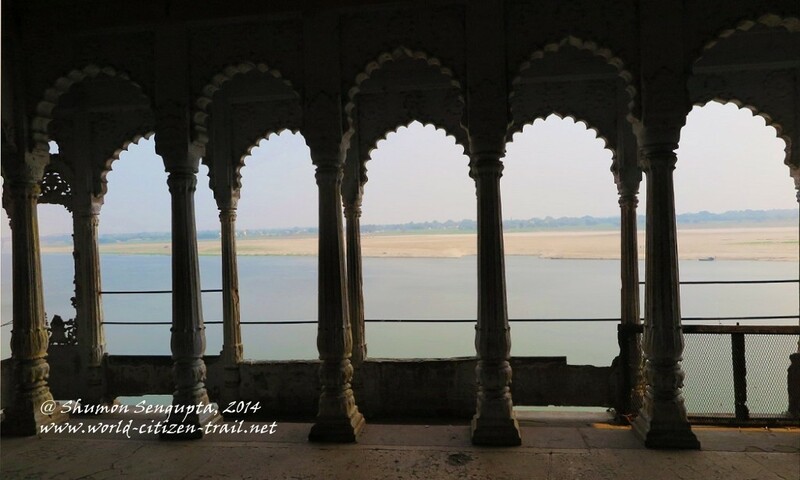 the eastern, right side of the river is a flood plain and in the dry season it gets transformed into a long and wide stretch of sand. 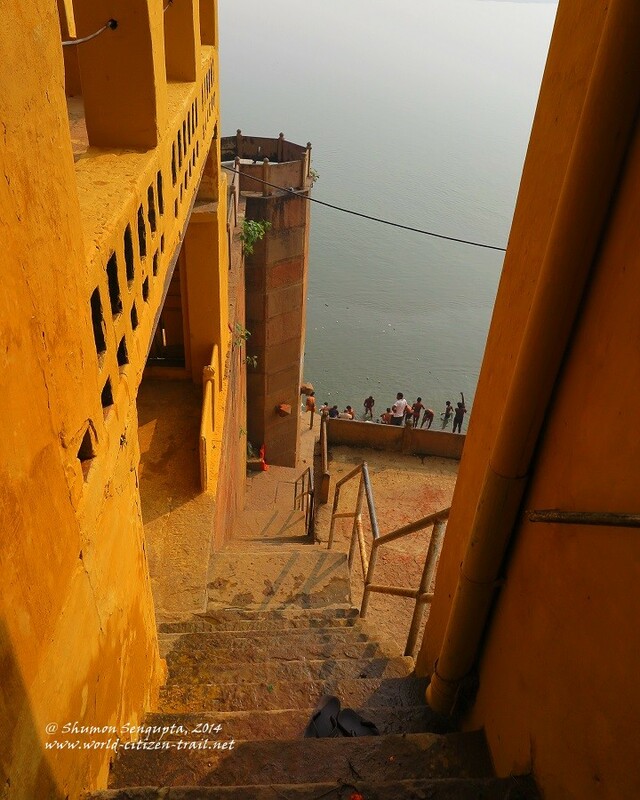 Rising steeply from the river and soaring above it, the left bank is wrapped cheek-by-jowl by a magnificent and seamless architectural array of masonry platforms and steep flights of steps and landings, known as ‘ghats’. The ghats are shadowed by lofty fortress, majestic palaces, exquisite temples and shrines with their sky piercing ornate spires, ashrams (hermitages attached schools for religious studies), monasteries, mosques, pavilions and tiered houses. 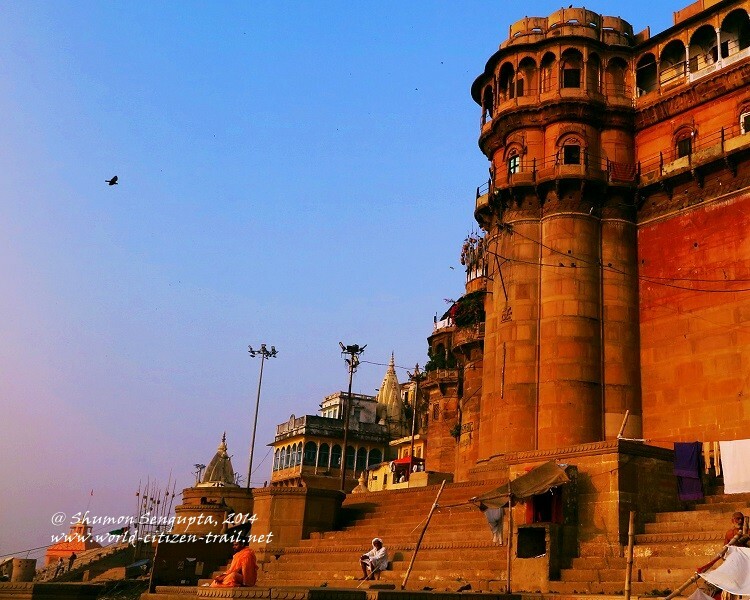 And within this also lies two cremation grounds, called the Manikarnika and Harishchandra ghats, distinguished by burning pyres and rising smoke. 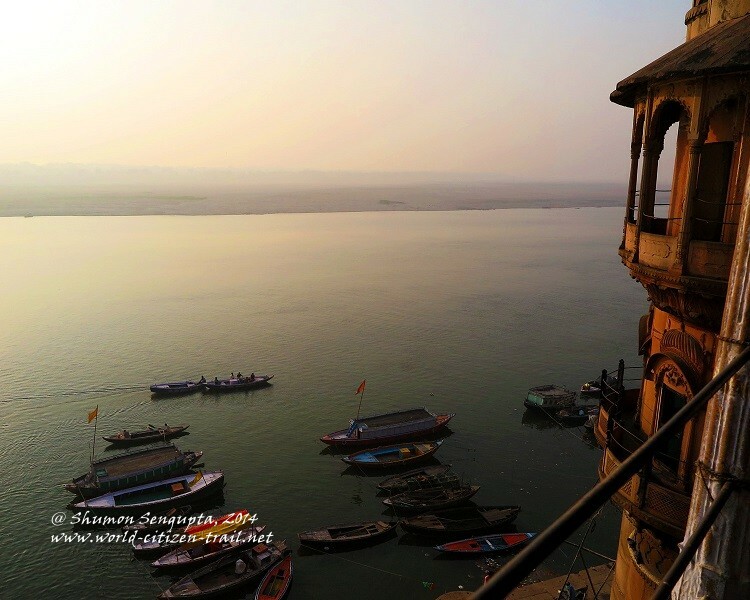 The river-front presents an unusual blend of architecture and history, and the beauty of a very special landscape, making it a place of outstanding aesthetic harmony between nature and culture. 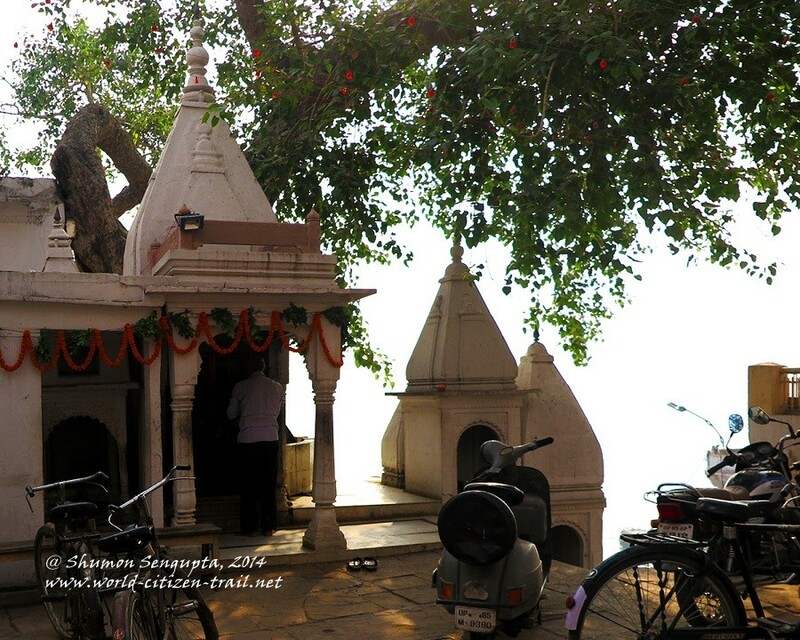 This is a space where the hermit meets the hedonist – where ceaseless human action exists side by side with profound stillness and deep contemplation; where the ringing of temple bells, the chanting of mantras and the melody of devotional music mix with the fragrance of flowers and incense, and at places, the stench of garbage and smoke of burning wood and flesh; where beauty jostles with ugliness, and joy with grief. 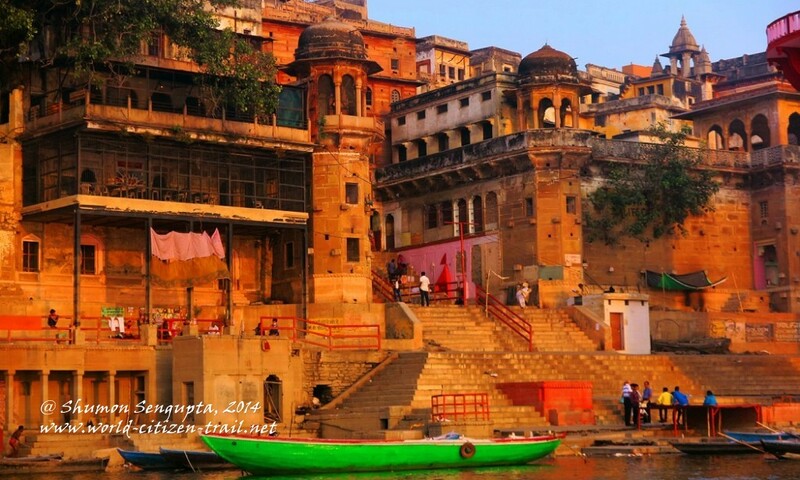 Over these ghats, and above them, along numerous narrow labyrinthine lanes and passages, moves the unceasing theatre of life and death, and for the devout Hindu, the hope of moksha – i.e. 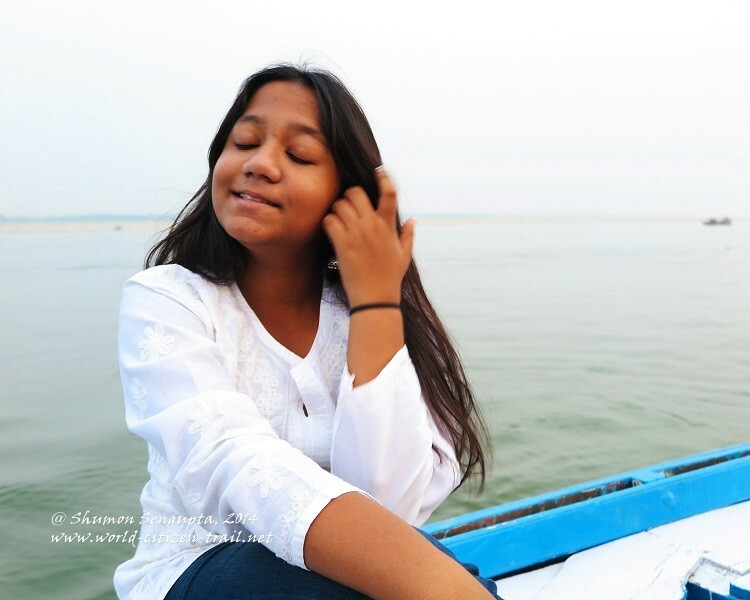 liberation, or transcendence. 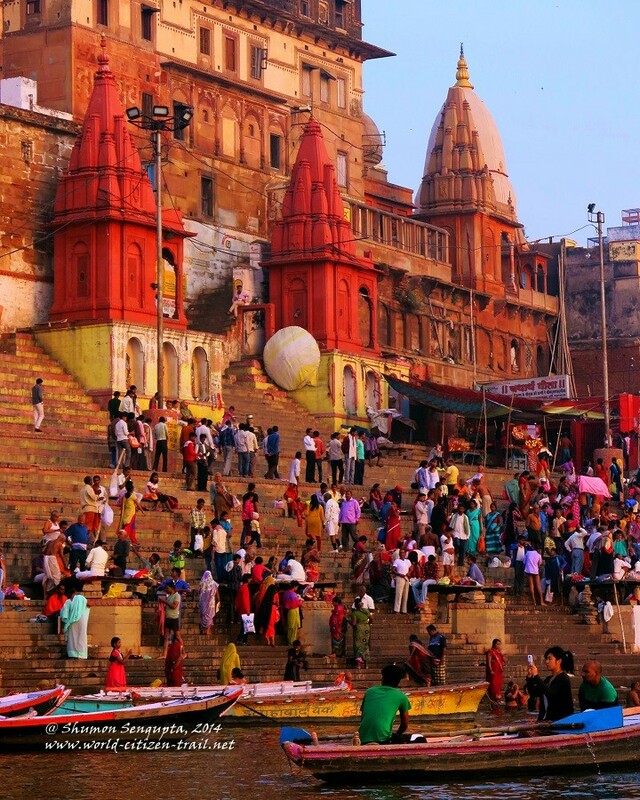 As the Ganges flows by in its ebbs and tides, this ancient riverfront serves as a grand proscenium – as much for spiritual quest, as for material gratification. 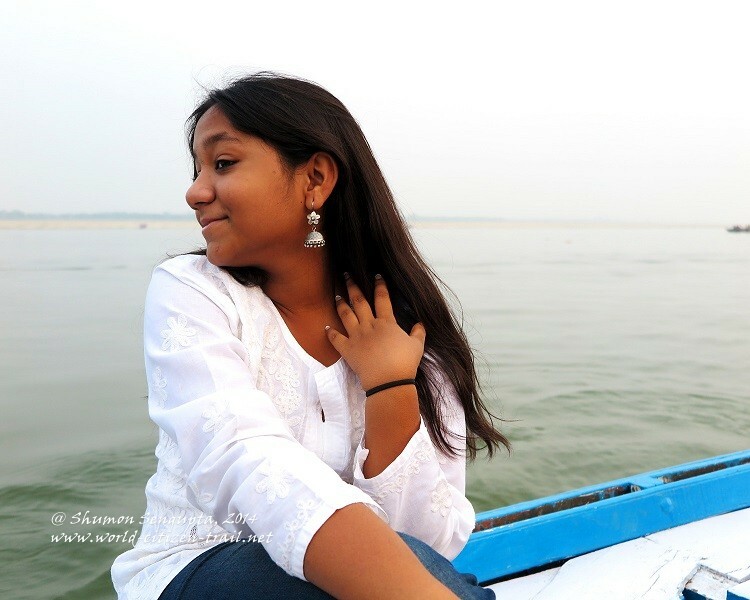 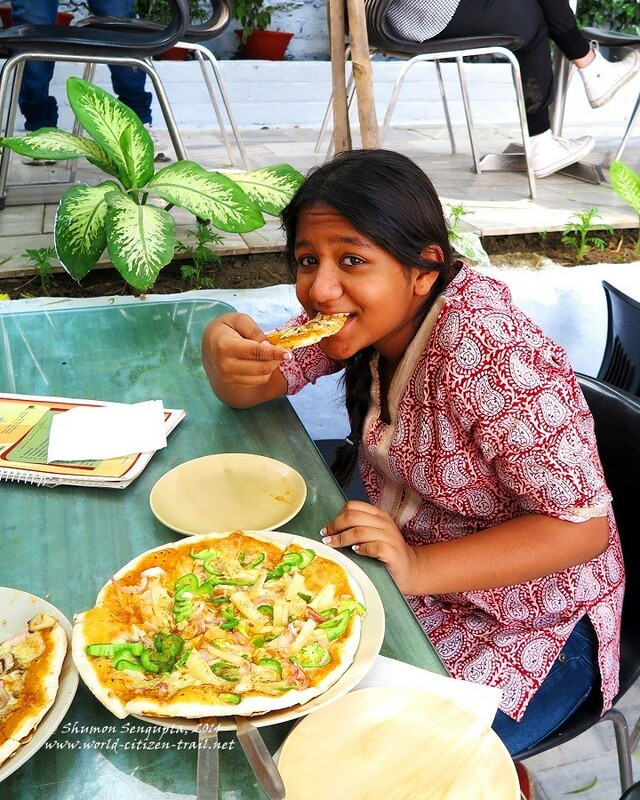 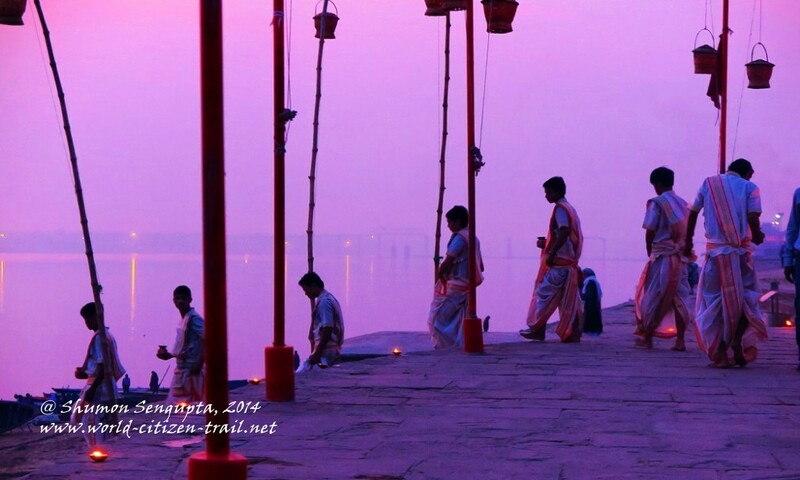 It is at the waterfront that you get a glimpse India’s enduring enigma and mystic charm. 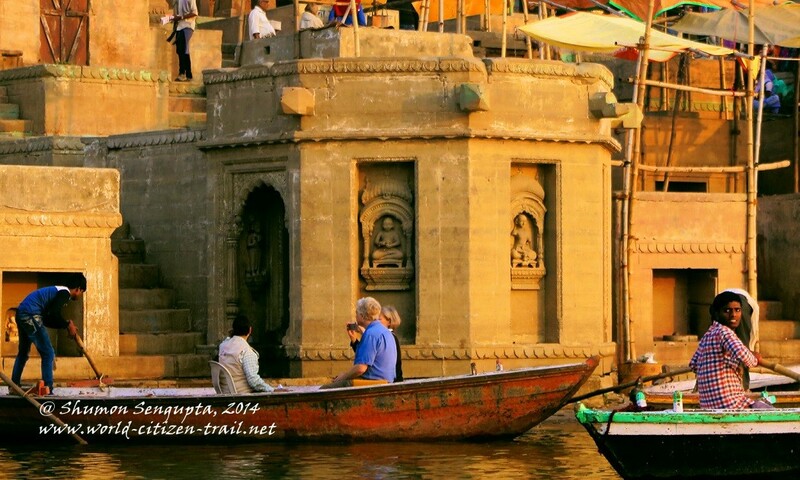 You get a hint of a civilization at its most ancient state and yet on the move. 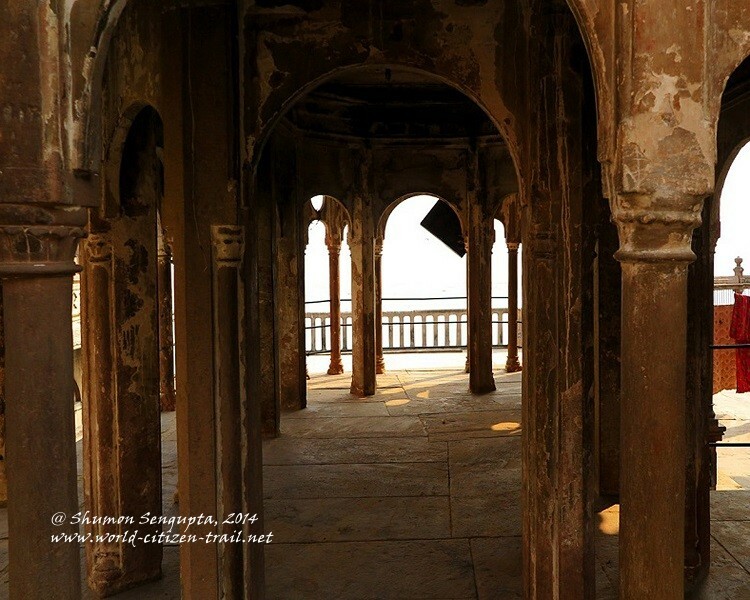 It is here that one encounters the tableau of ‘continuity in change’, where the ancient coexist with the modern. 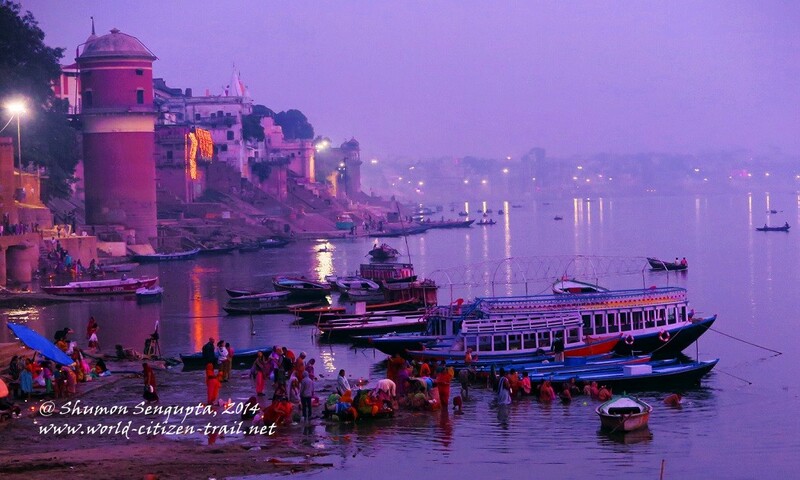 It presents a sight that is as spectacular as it is mystifying and bewildering. 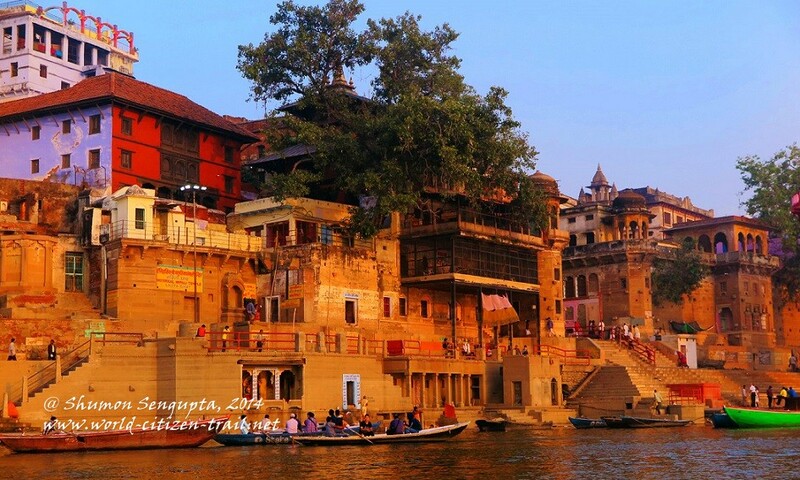 Along the stretch of eighty four named ‘ghats’, five are considered to be the most sacred. From the south to the north, these are Assi, Dashashwamedh, Manikarnika, Panchaganga and Adi Keshava. 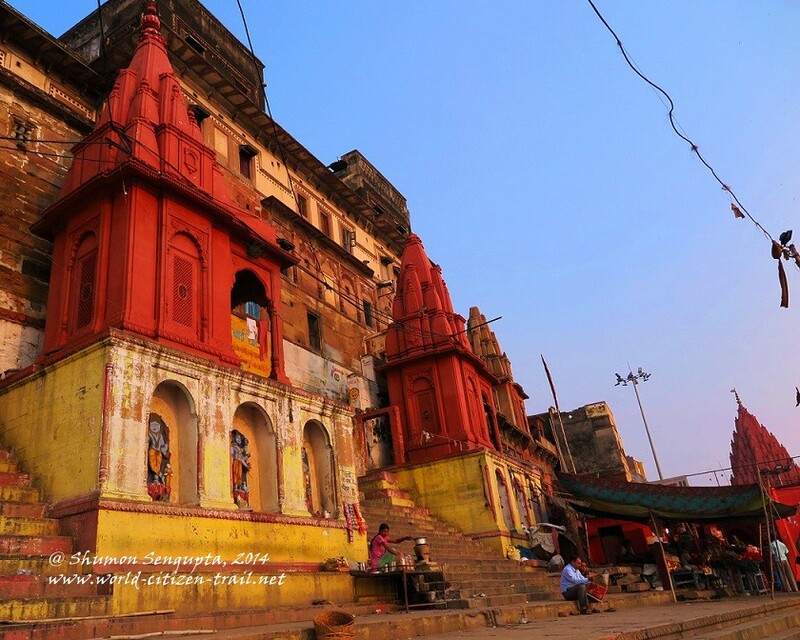 The masonry buildings on the Assi Ghat were initially built by the King of Varanasi in around 1830 and the adjoining Tulsi Ghat was where the great medieval saint Tulsi Das lived and composed his works. 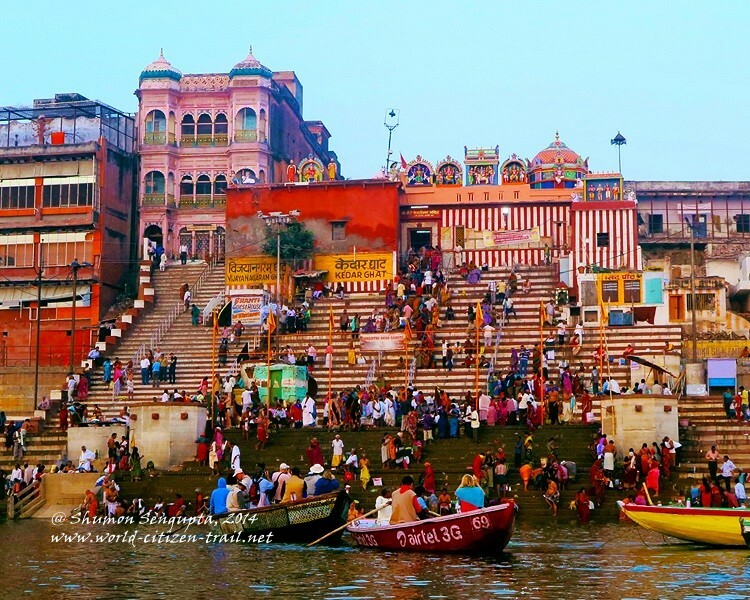 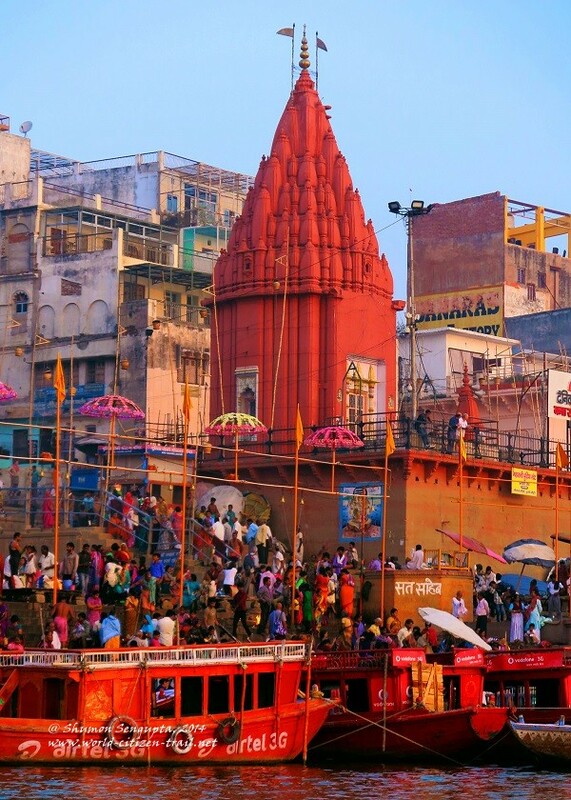 The Dashashwamedh Ghat is the busiest of all, with as many as six prominent temples (including one for River Ganges) and numerous smaller shrines. 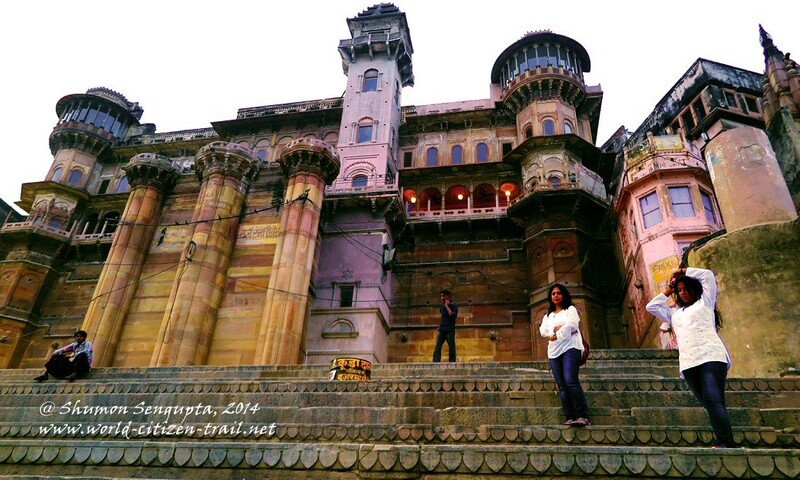 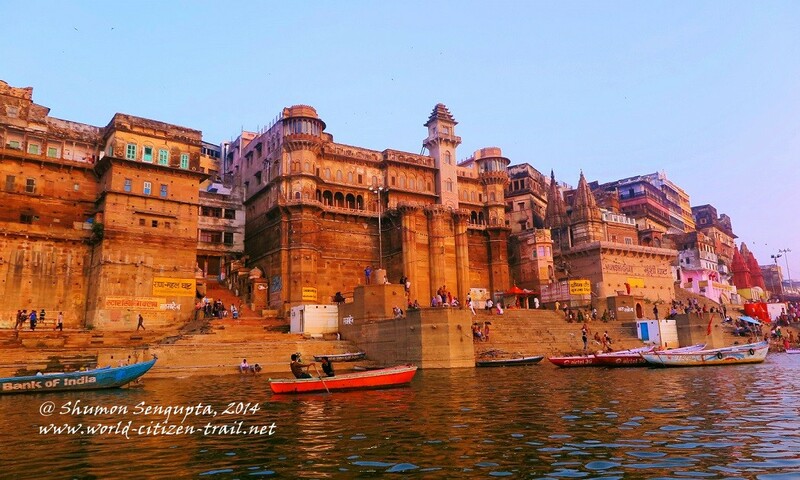 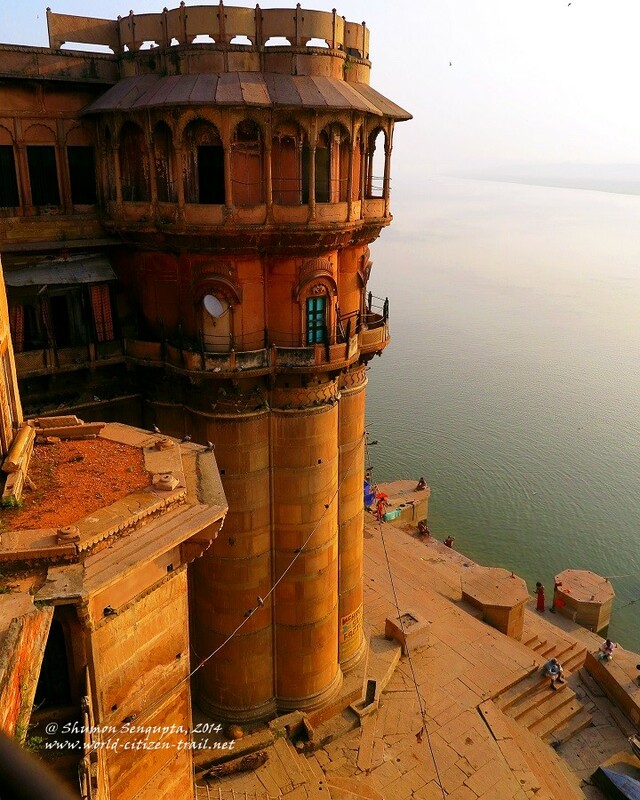 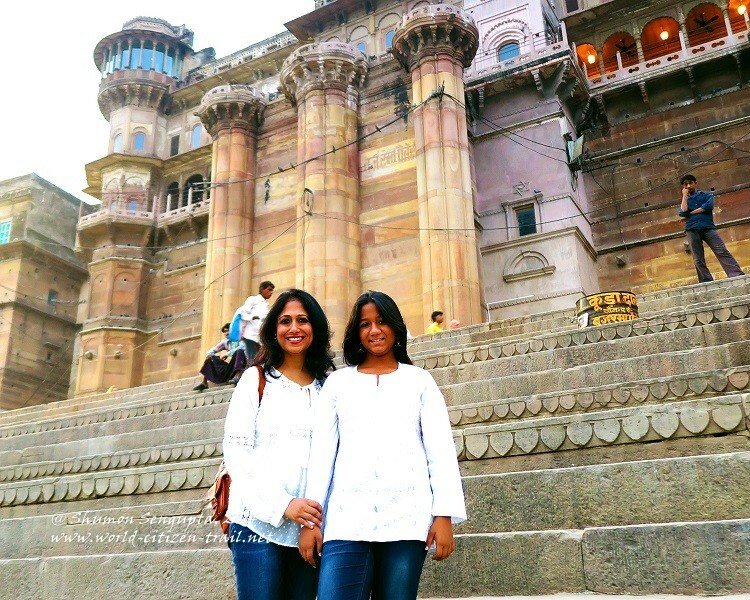 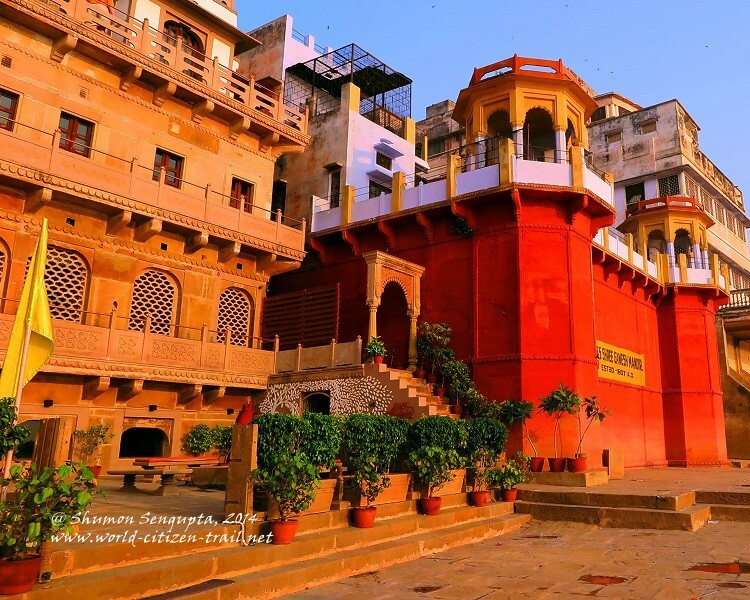 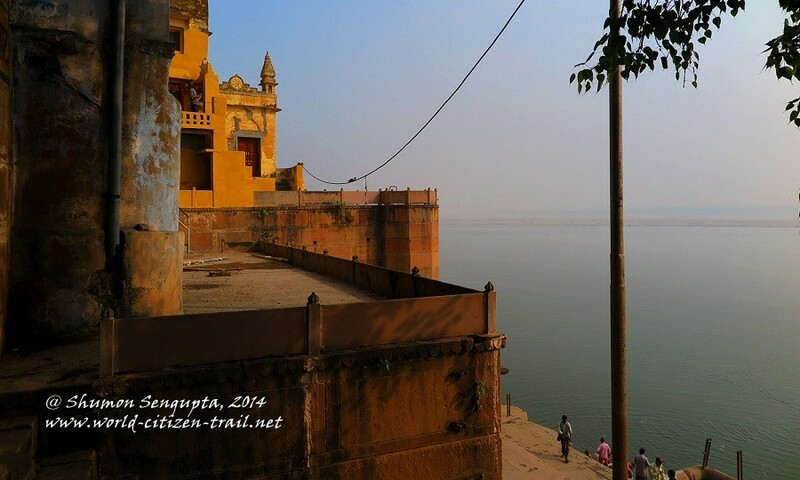 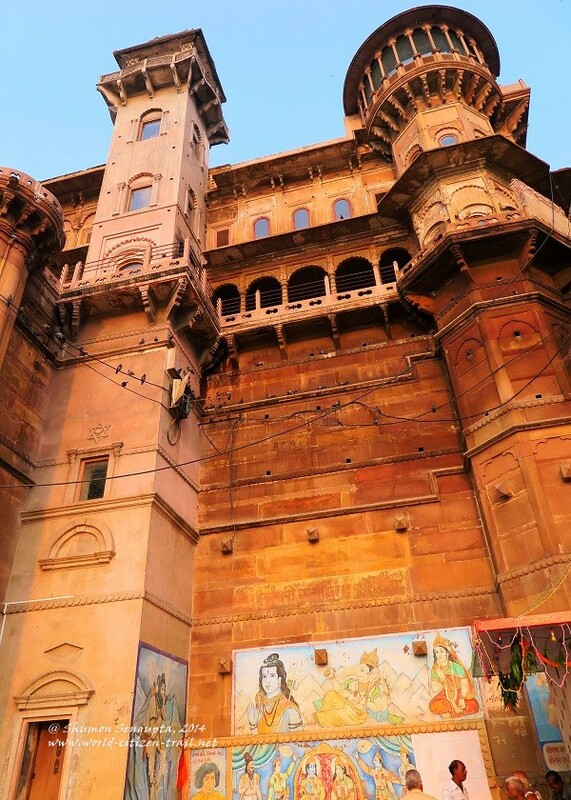 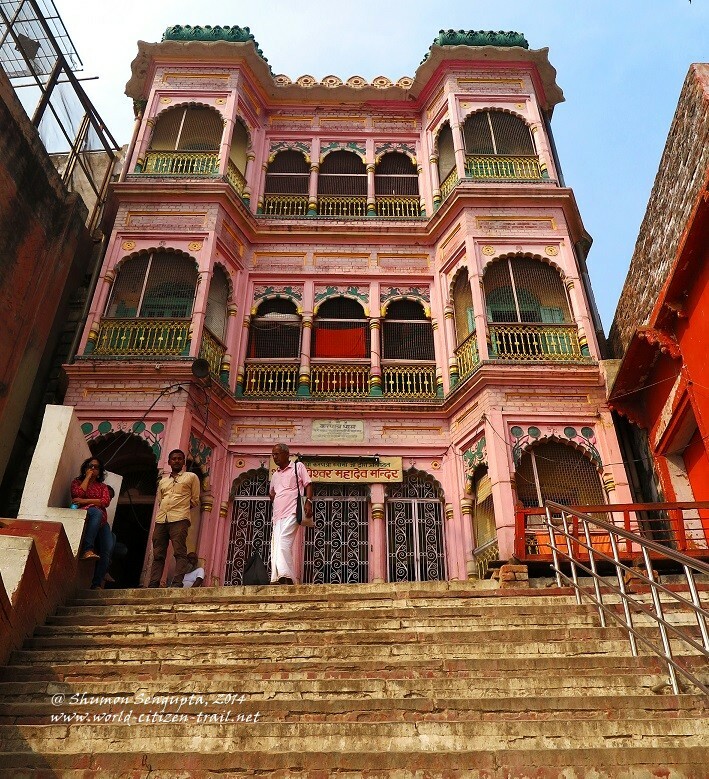 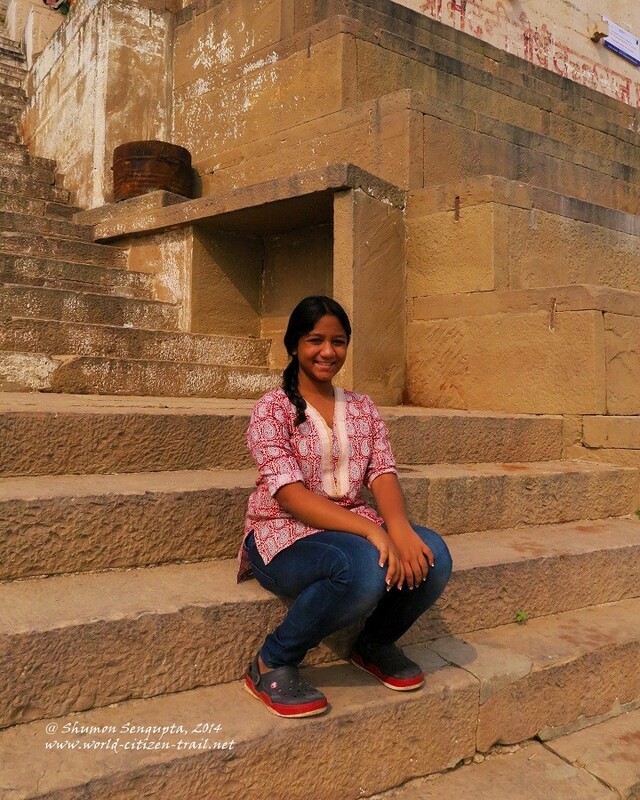 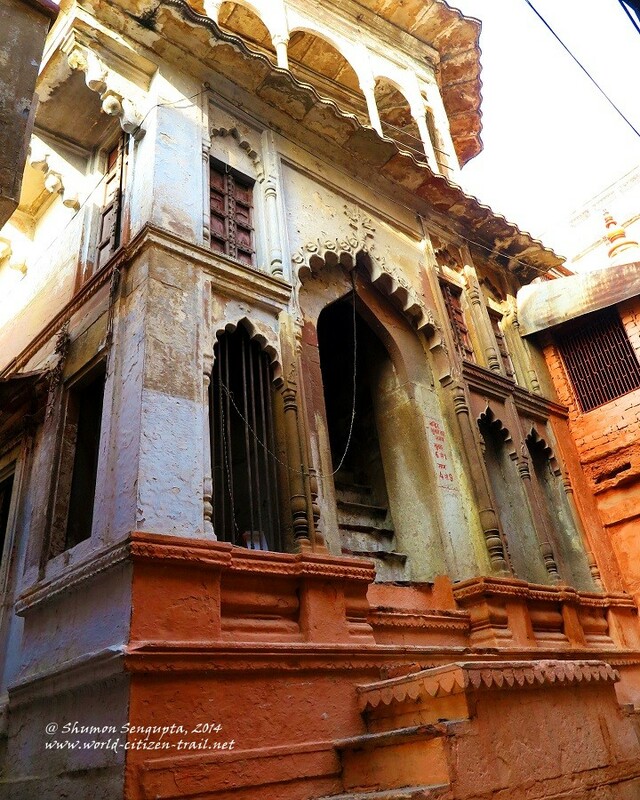 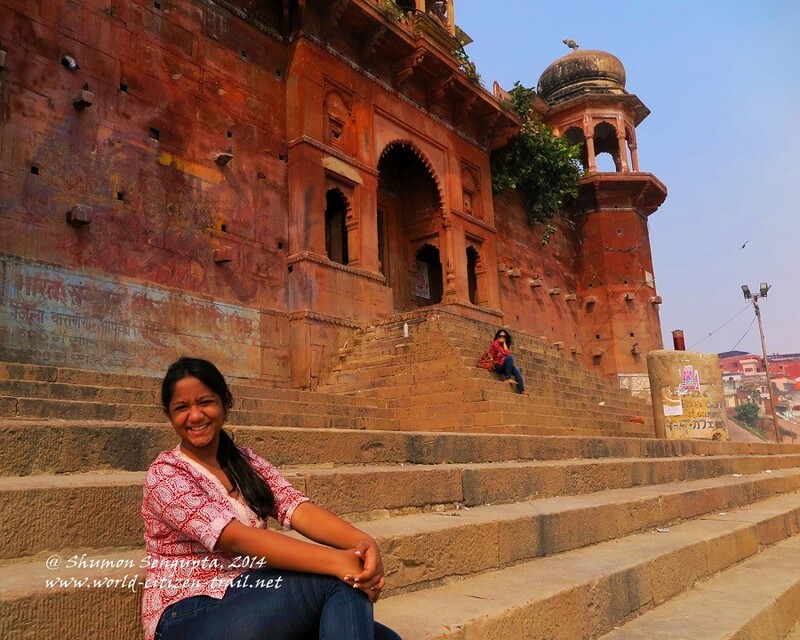 And adjacent to this ghat are the imposing fortresses and hanging balconies of the palaces of erstwhile King of Kashi, the King of Darbhanga and the Munshi ghat. 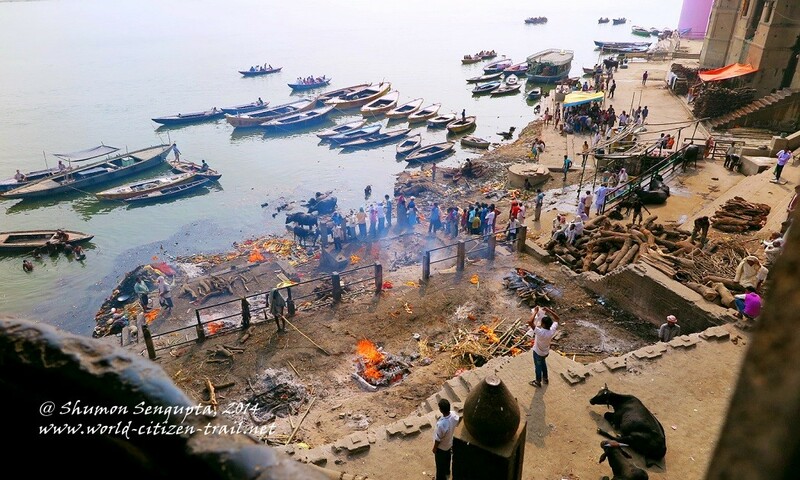 Manikarnika ghat is the great cremation ground where funeral fires are reported to be burning day and night without a break for the last 800 years. 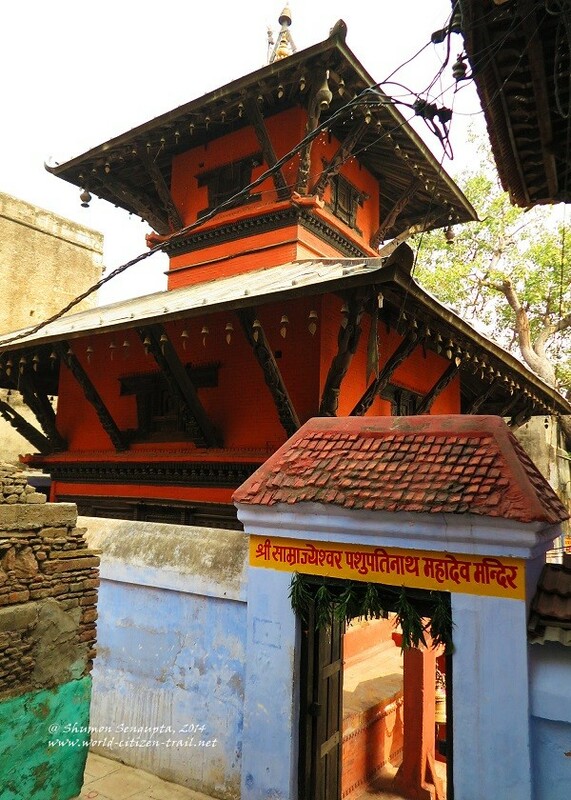 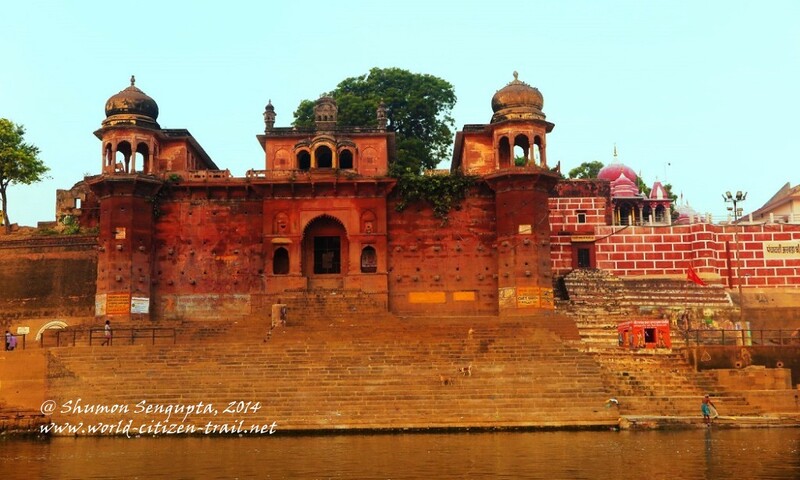 This ghat has a few temples including an imposing deep red one. 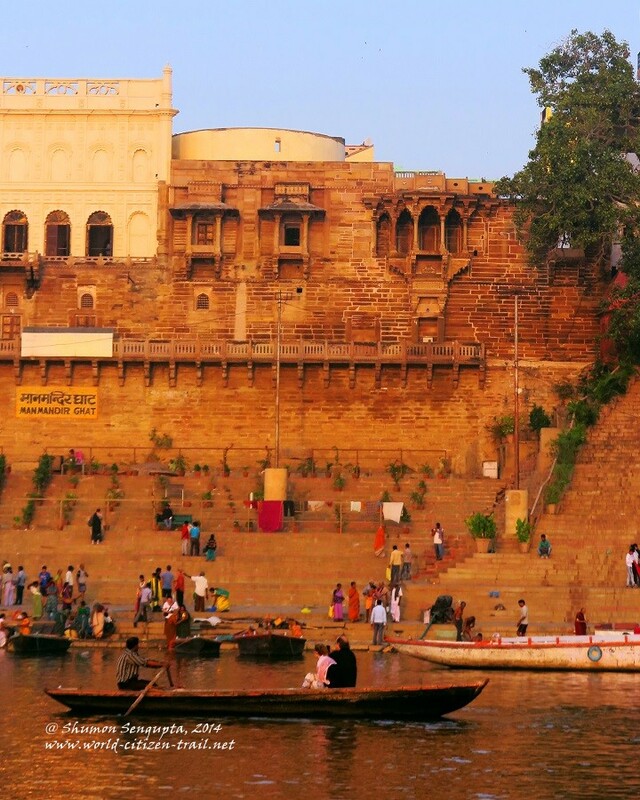 It is built on a broad terrace overlooking the river. 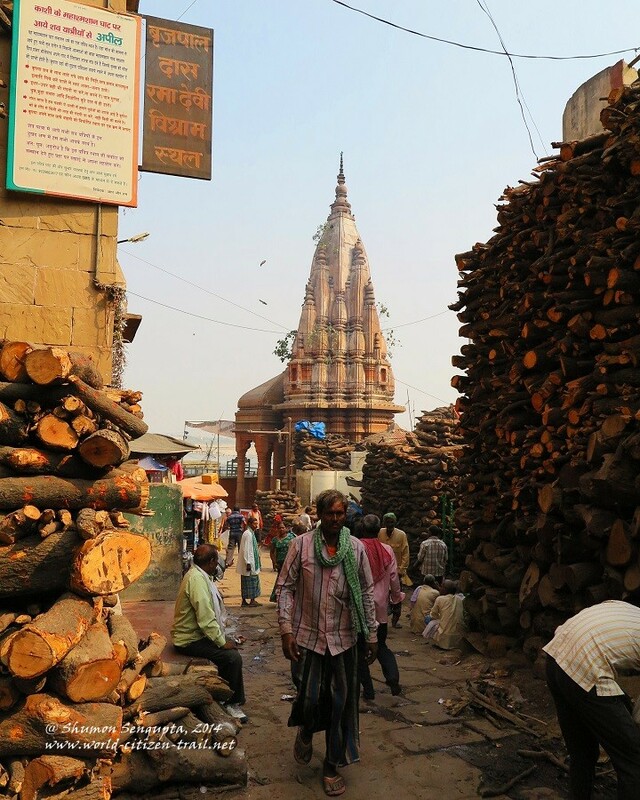 Around this place you find logs stacked in piles that are as high as they are grim. 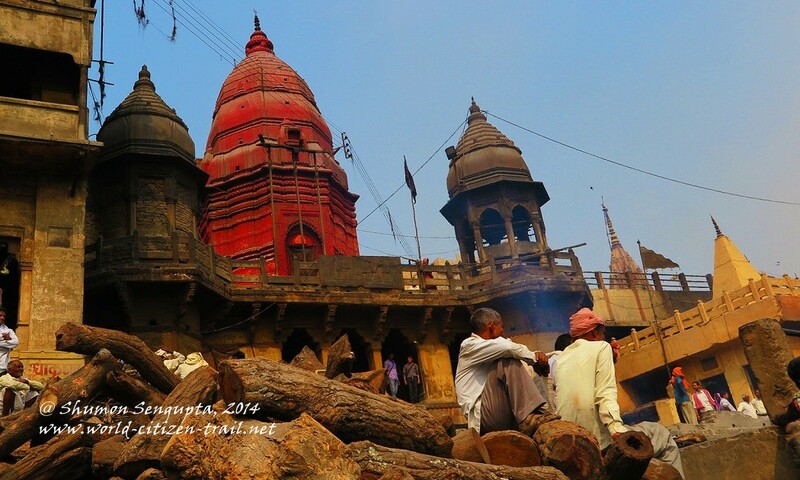 The Dom community, till date a highly marginalized traditional caste based occupation, which tends to the cremation grounds and burns the dead, also rear their cattle (mainly buffaloes) here. 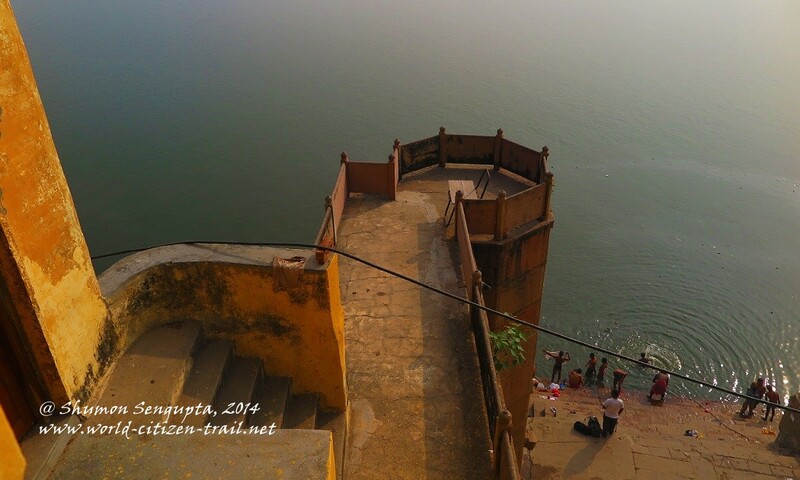 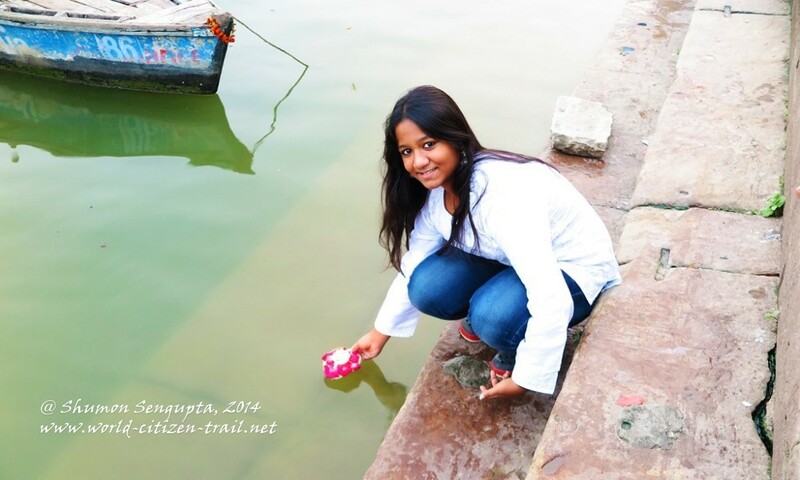 A part of this ghat is also used for ritual bathing and funeral rites. 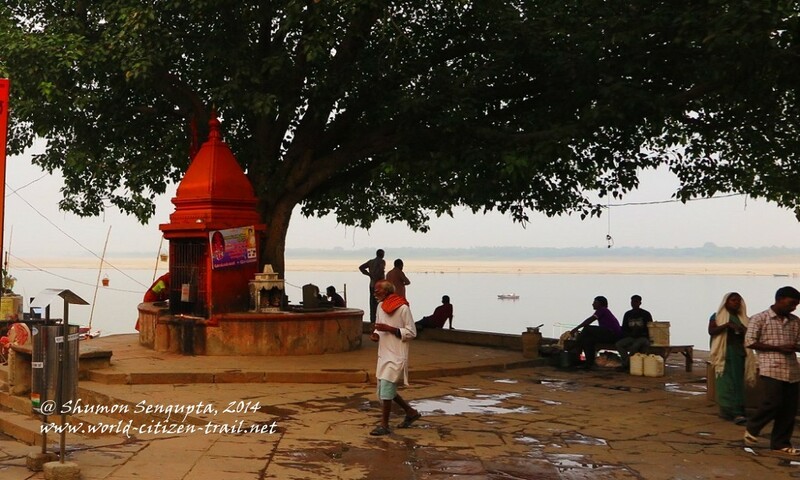 This is probably the only place on earth where you find the living and the dead (the corpse is given a dip before cremation) taking bath in the same waters at the same time, alongside cattle, and sometime even dogs. 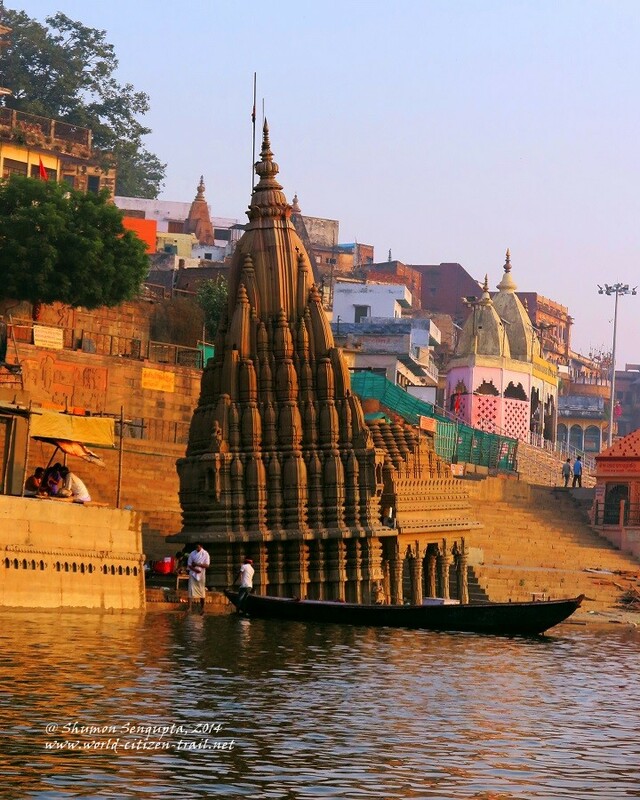 Hinduism, with its immensely complex and profound of philosophy, and with all its aesthetic refinement, continues to lack a sense of civic aesthetics and environmental hygiene. 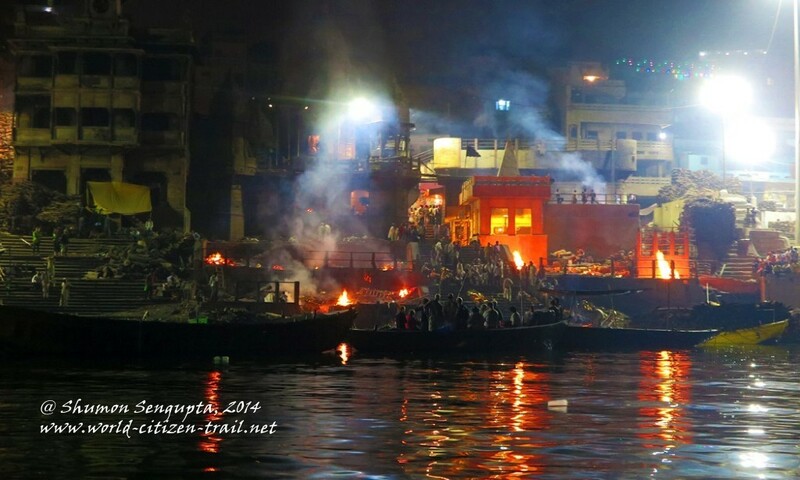 To me, the practice of burning dead bodies in open pyres and disposing the ash (and sometimes even half burnt bodies) into the river are abominable examples of the material, civic and spiritual ugliness that many Hindus continue to dwell in till date. 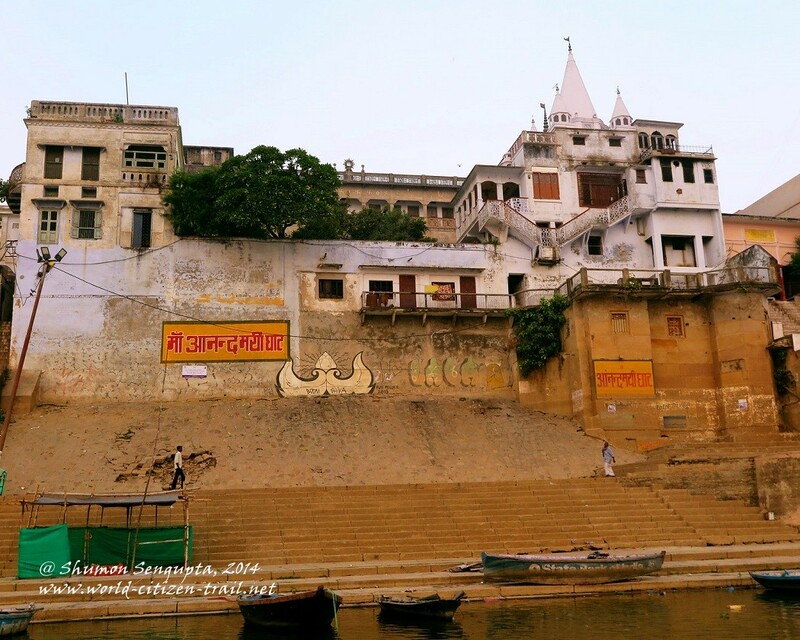 The Panchaganga ghat – held to be very sacred by Hindus, once had the grand Vindu Madhava (Vishnu) temple, which was demolished and converted into an imposing mosque in 1670, by Mughal emperor, Aurangzeb. 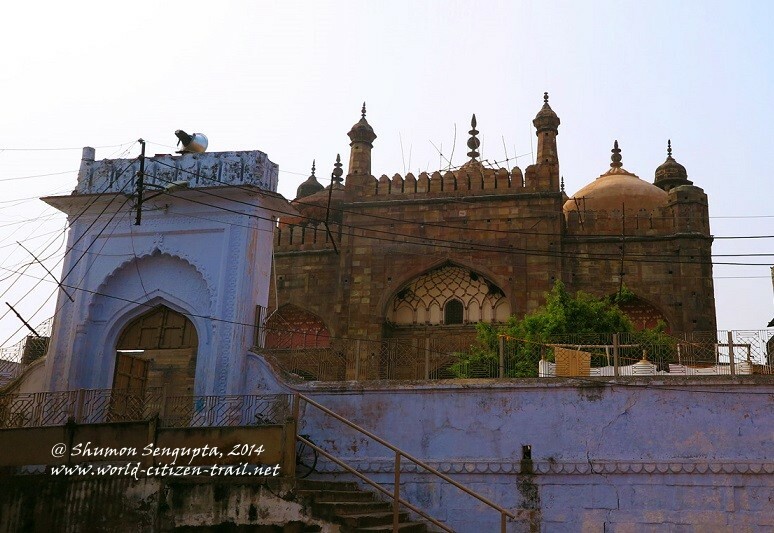 Seen from the river, this mosque provides a majestic sight, perched high above the river. 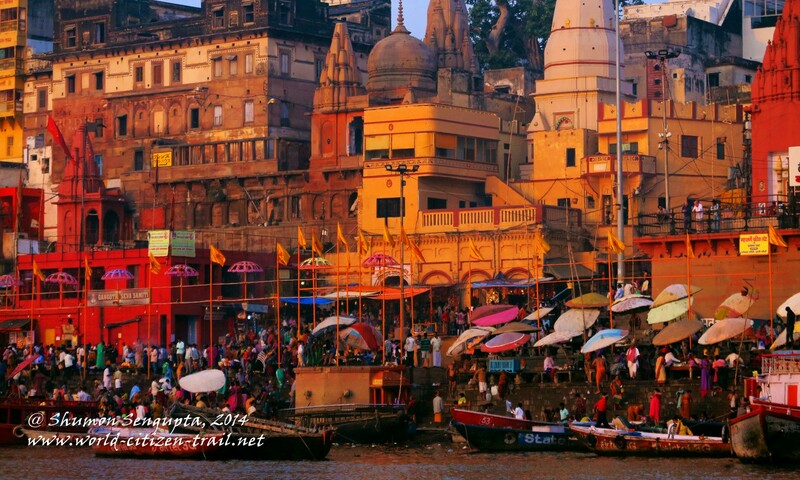 It lends a dramatic character to the arc of the river. 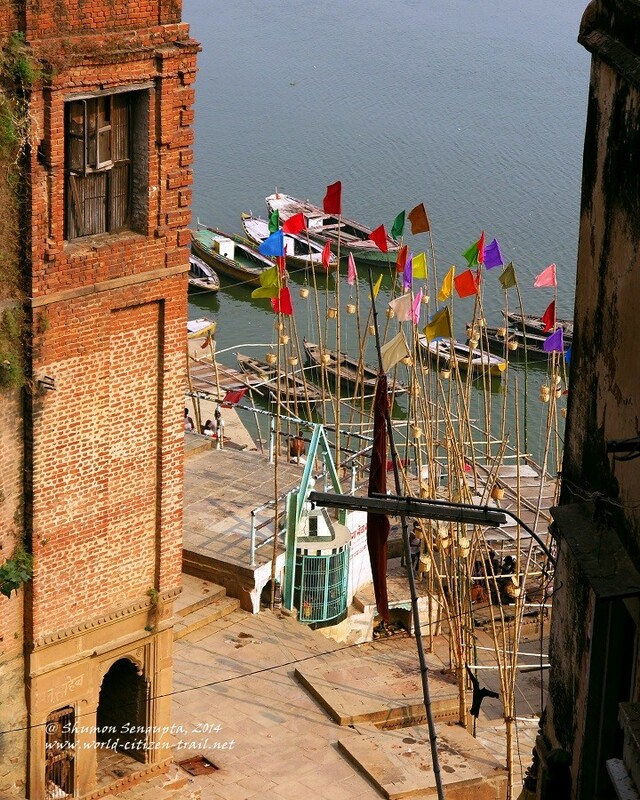 Another unique feature of this ghat is the cluster of colorful flags and oil lamp baskets hung from bamboo poles, in honor of the spirits of ancestors. 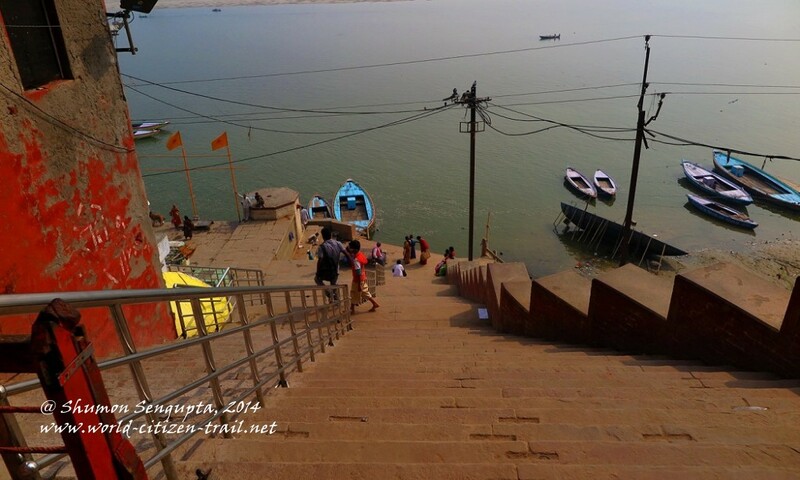 And last of the famous five ‘ghats’ is the Adi Keshava ghat, which has an important temple for the Hindu God, Vishnu. Some of the other ghats worthy of mention include the Kedar ghat, Lalita ghat and the Manmandir ghat and the Ganga Mahal Ghat. 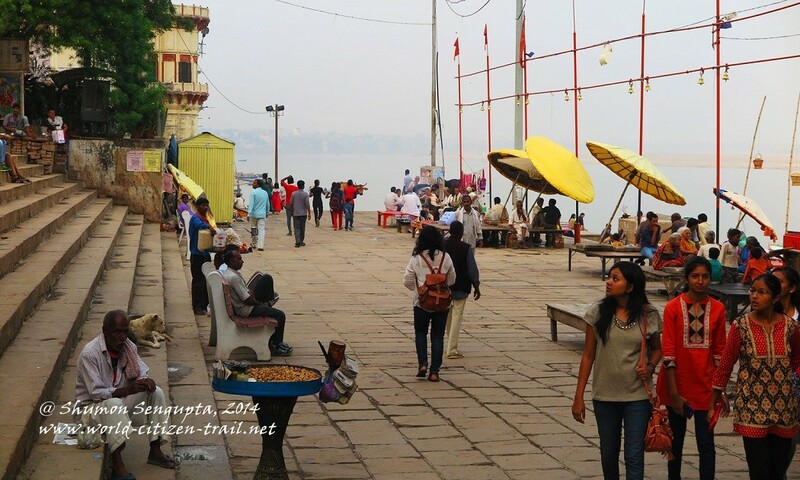 The Kedar ghat is probably the cleanest ghat, frequented almost exclusively by south Indian worshippers. 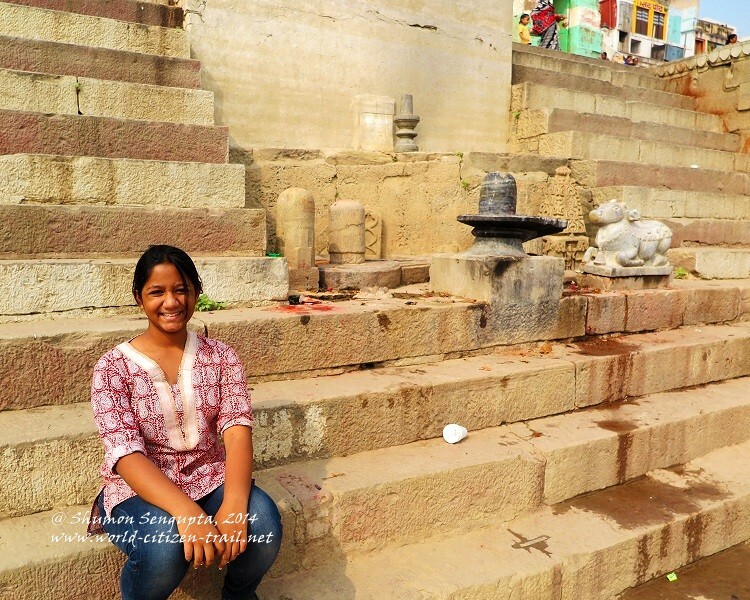 The Lalita ghat has beautiful stone platforms and a little shrine for ‘Mother Ganges’, represented as a female figure seated on a crocodile. 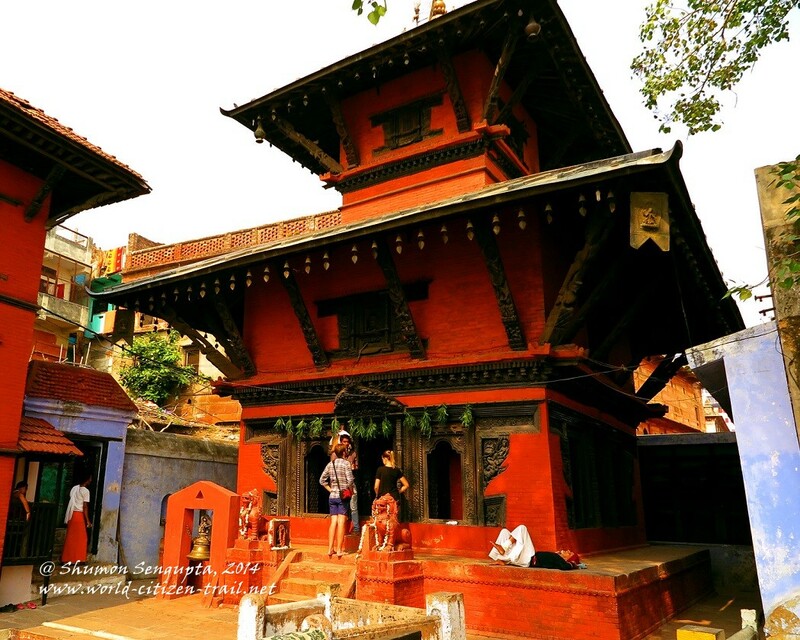 A flight of steep stairs leads to the Nepalese temple – an exquisitely carved, wood and brick temple, partially hidden by a sprawling ficus tree. 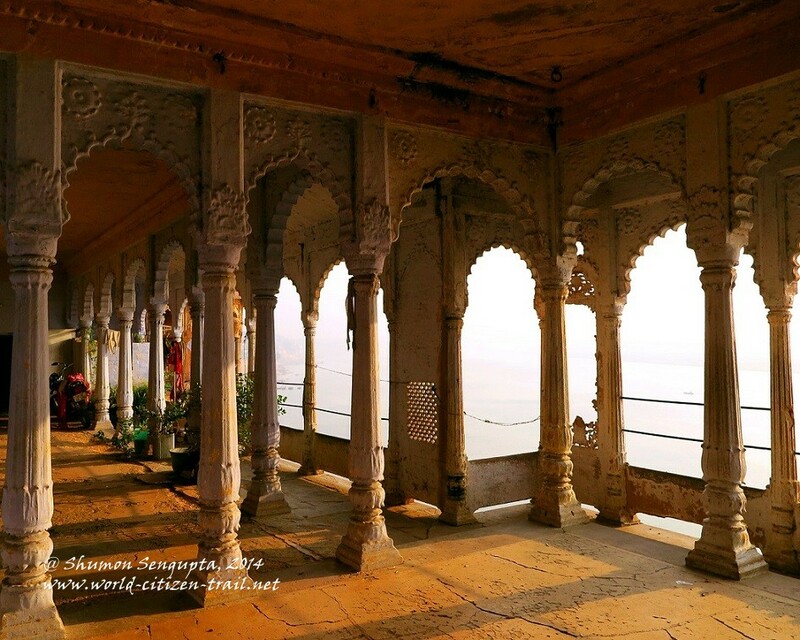 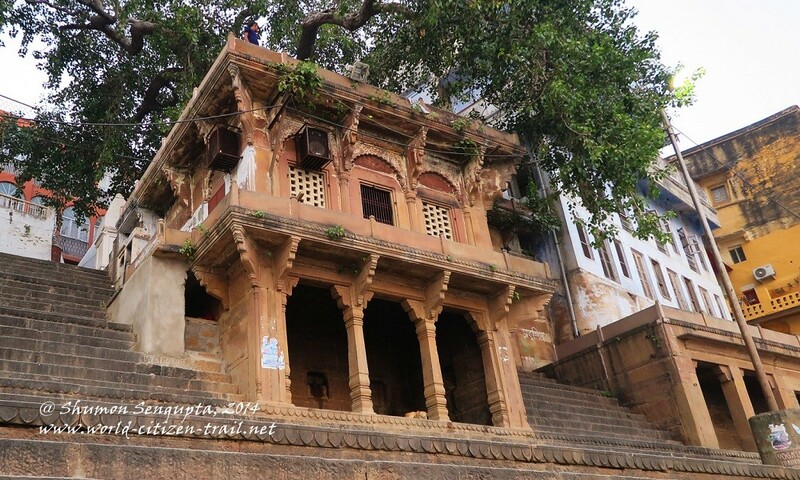 The Manmandir Ghat has a magnificent palace, with exquisitely carved hanging windows. 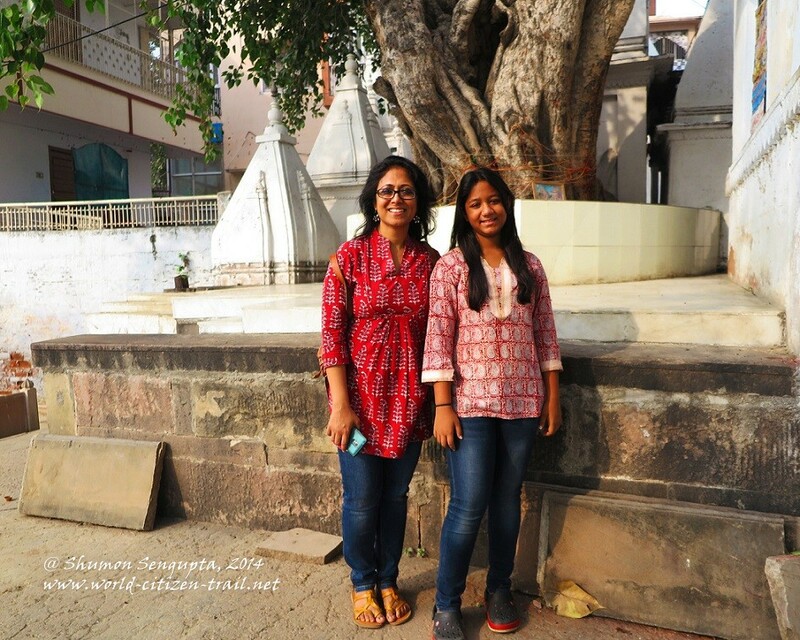 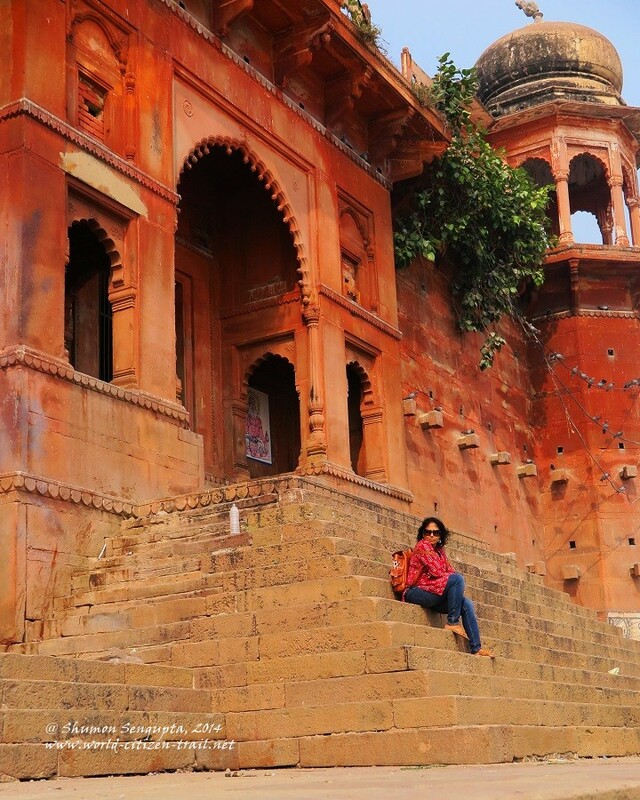 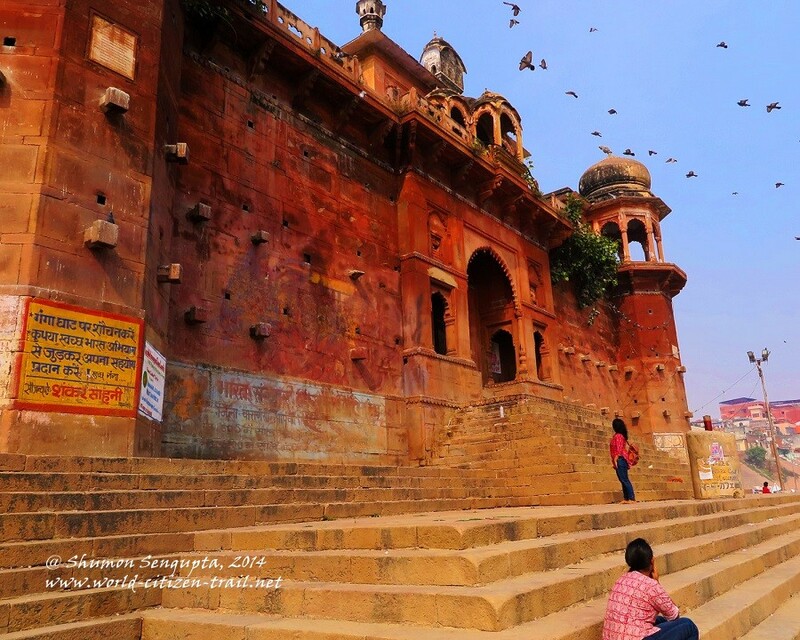 On top of this palace is an observatory built in the 17th century CE by Savai Jai Singh II. 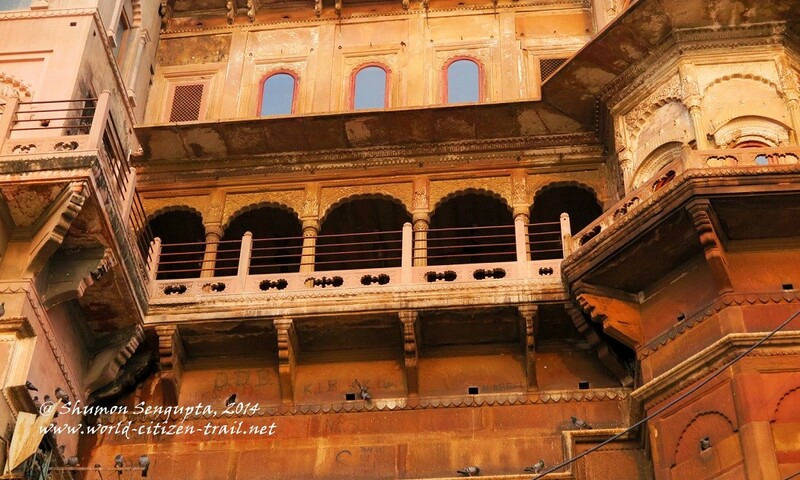 The Scindia and Bhonsle ghats also have very imposing and impressive masonry facades, with prominent temples at the top. 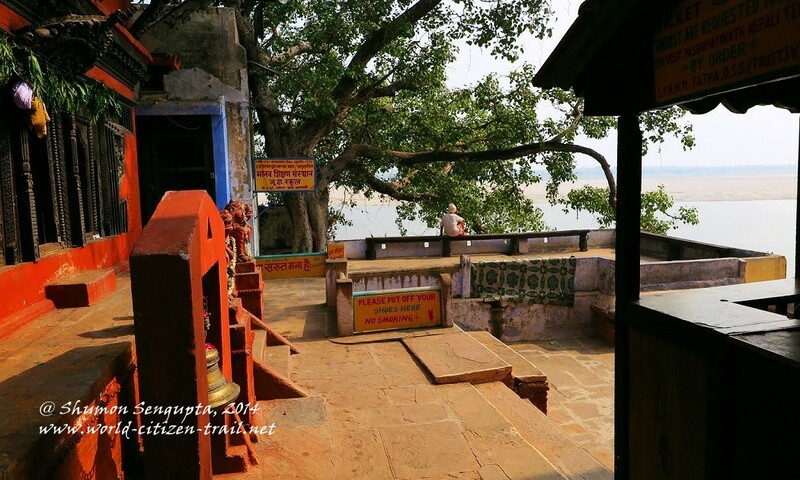 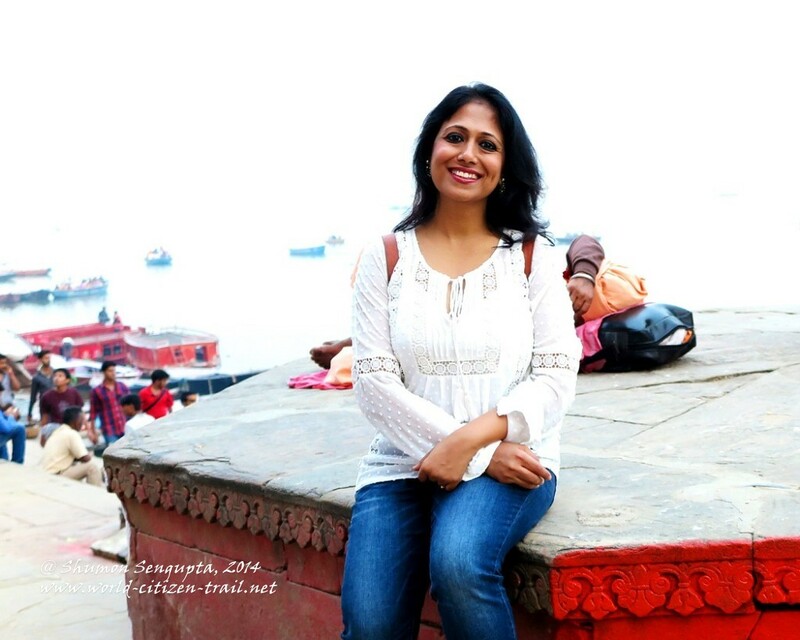 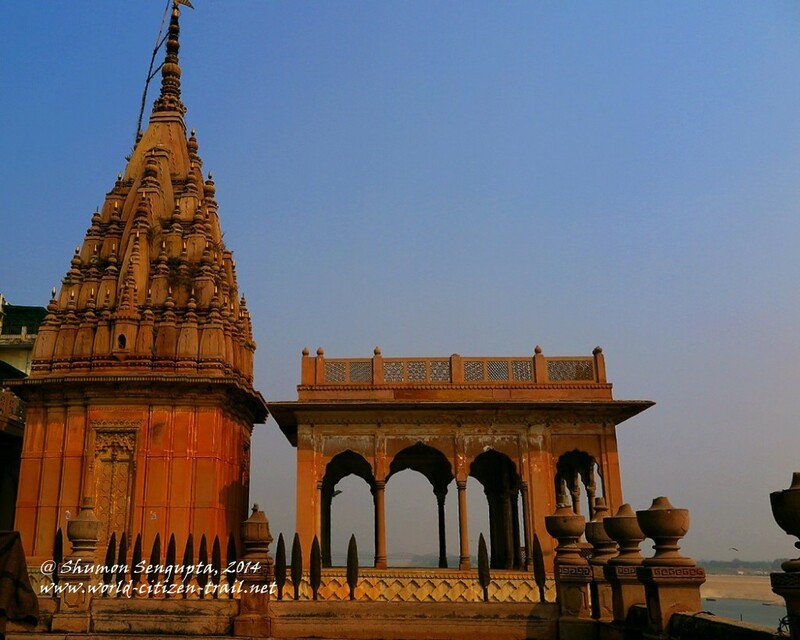 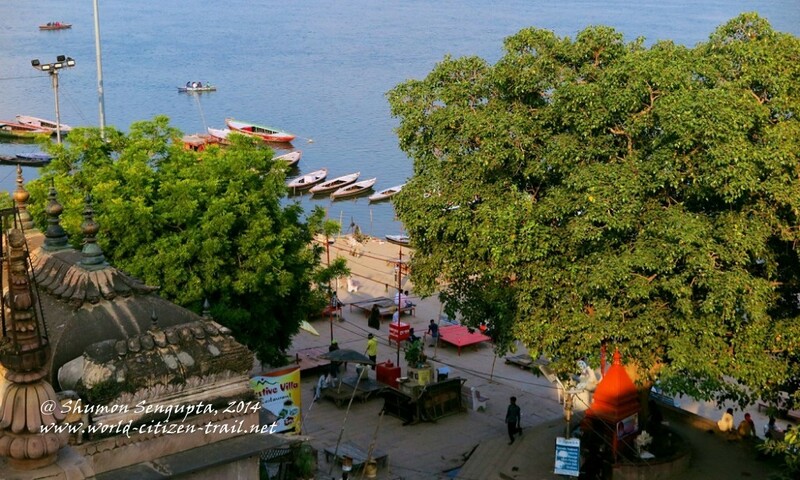 The Scindia ghat is particularly striking because of the picturesque old Shiva temple which is tilted and partially submerged in the Ganges, at its edge. 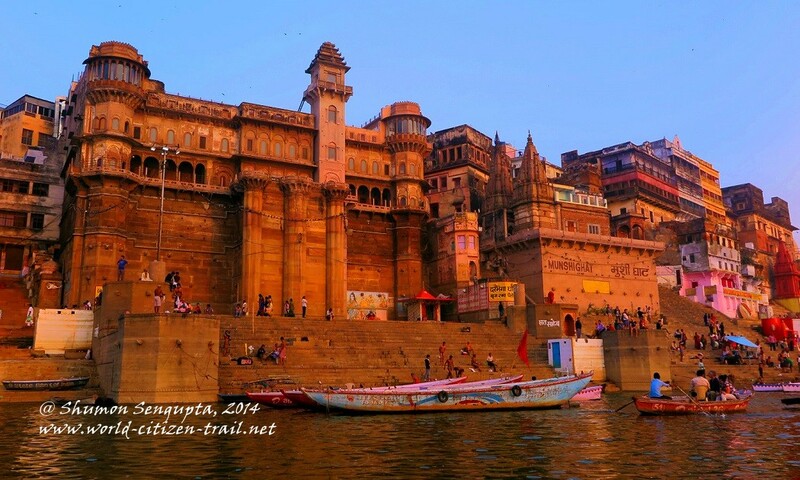 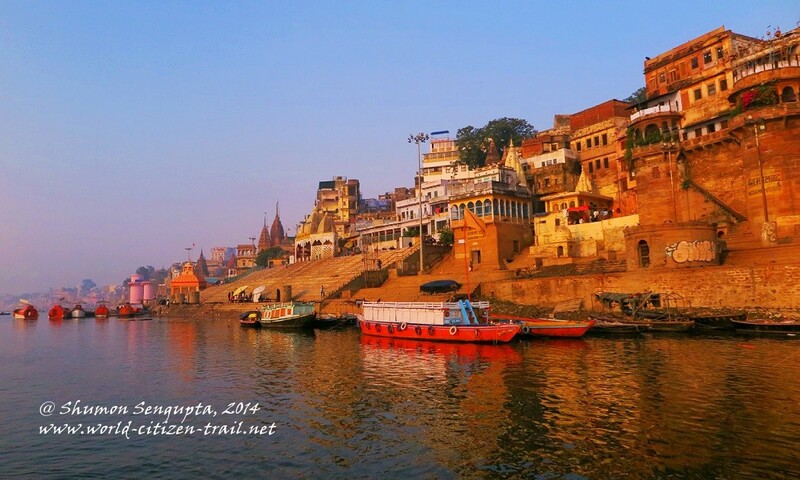 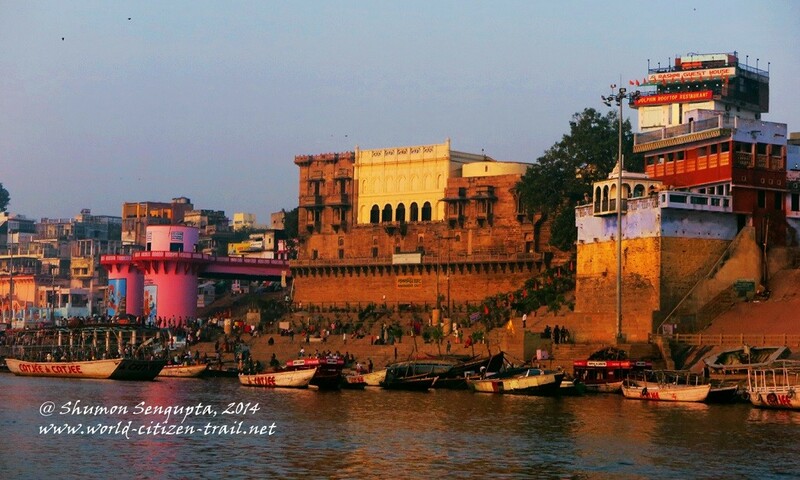 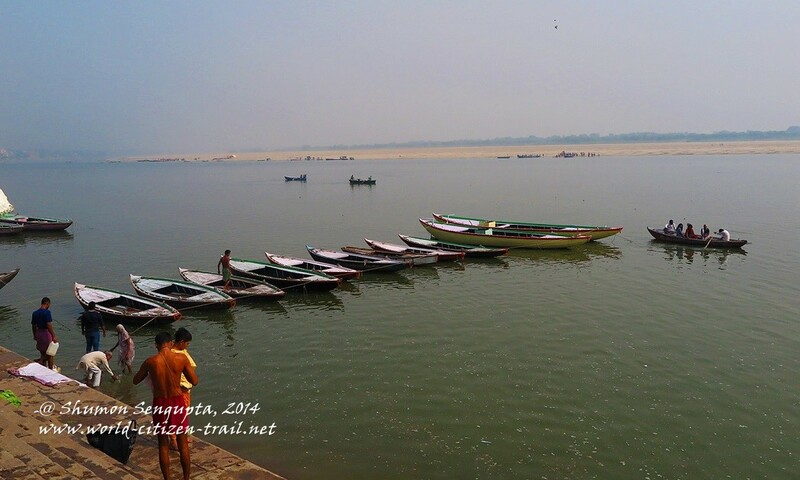 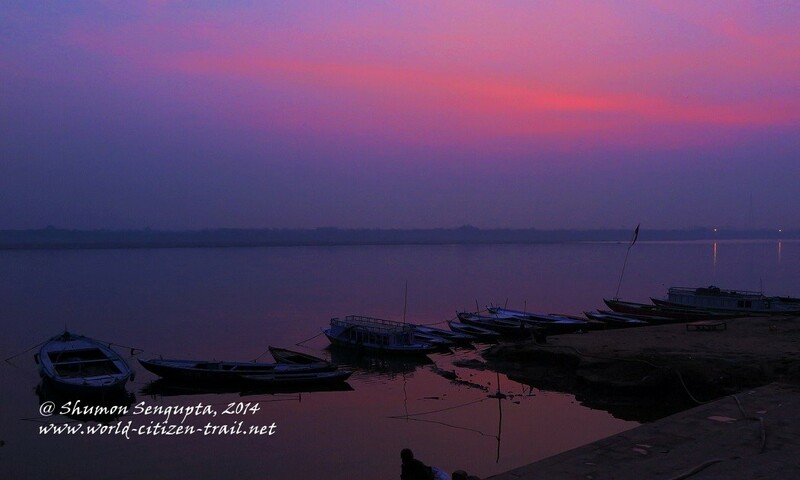 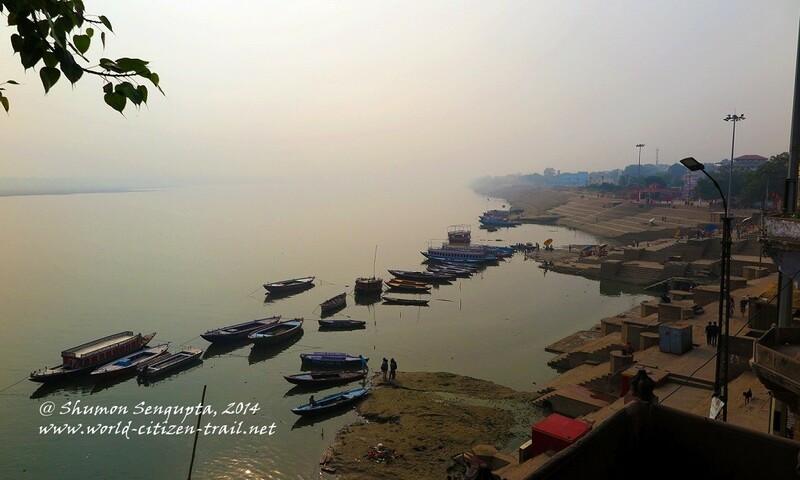 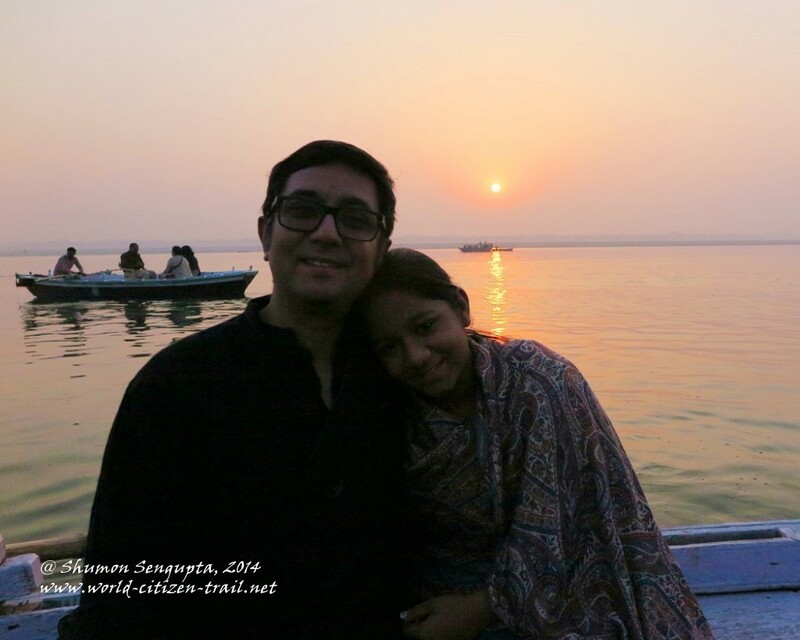 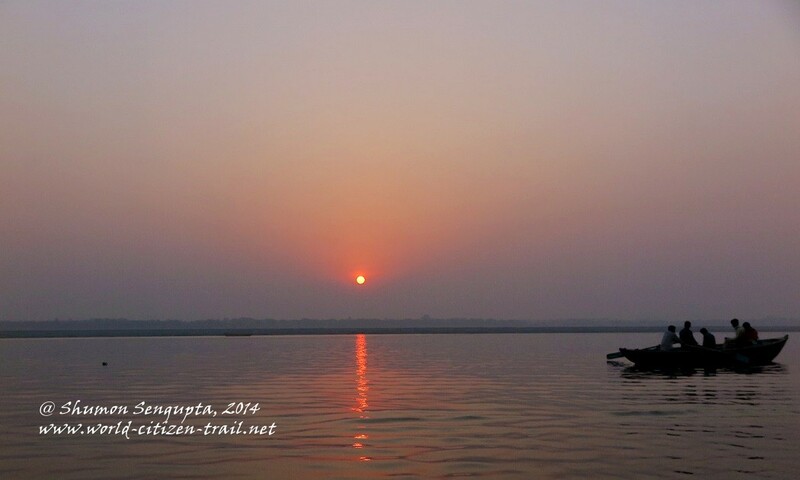 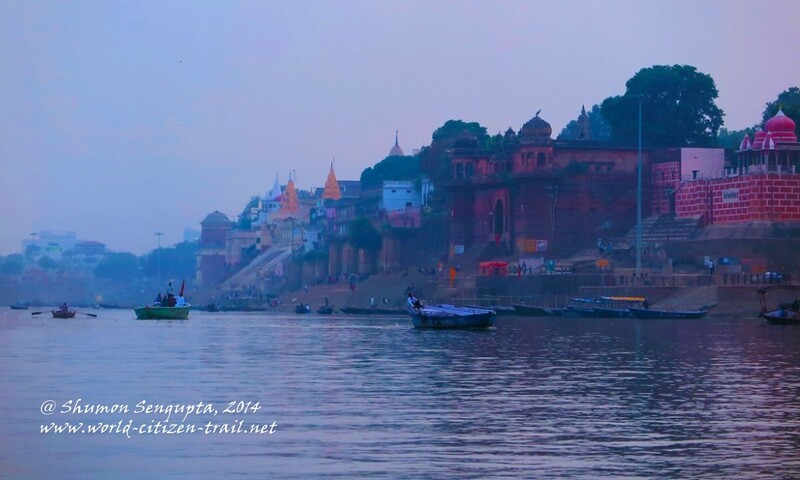 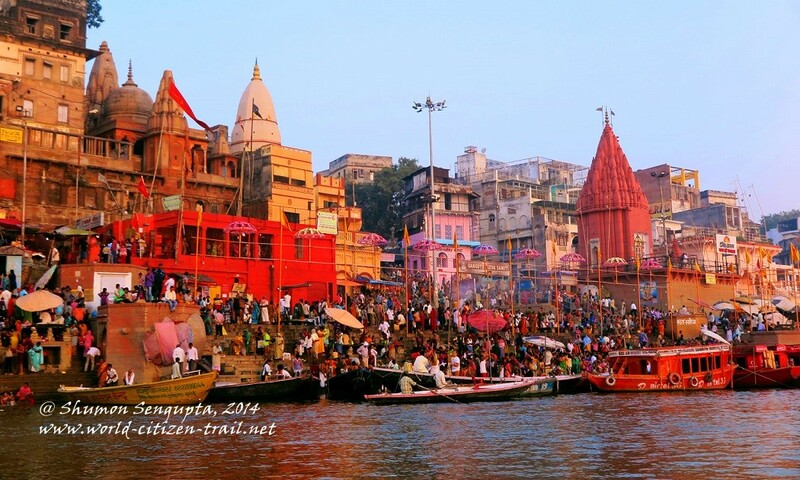 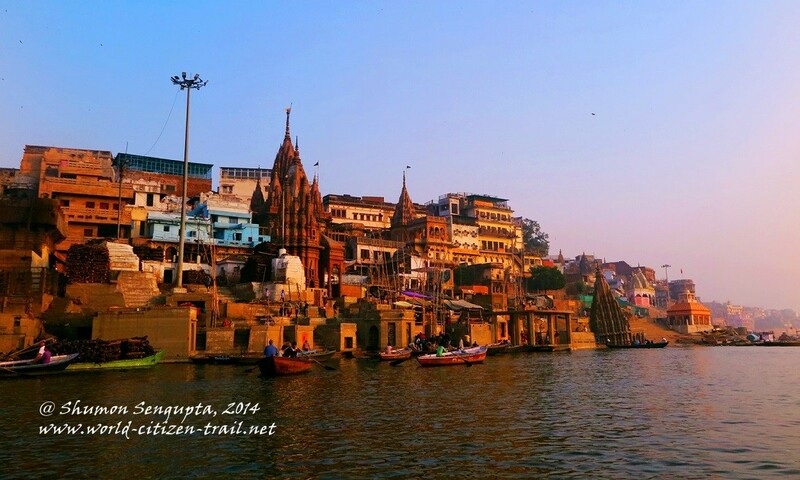 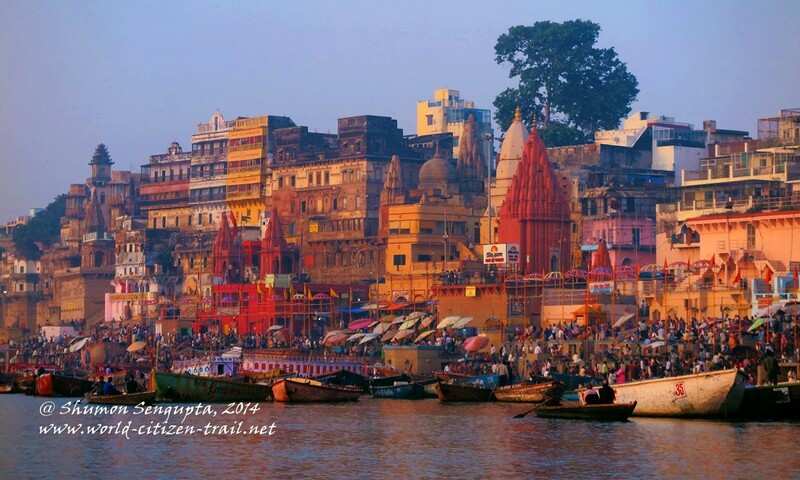 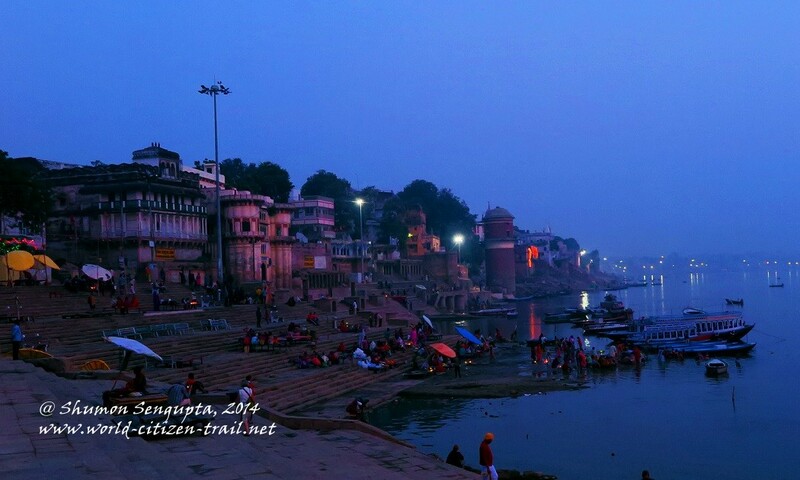 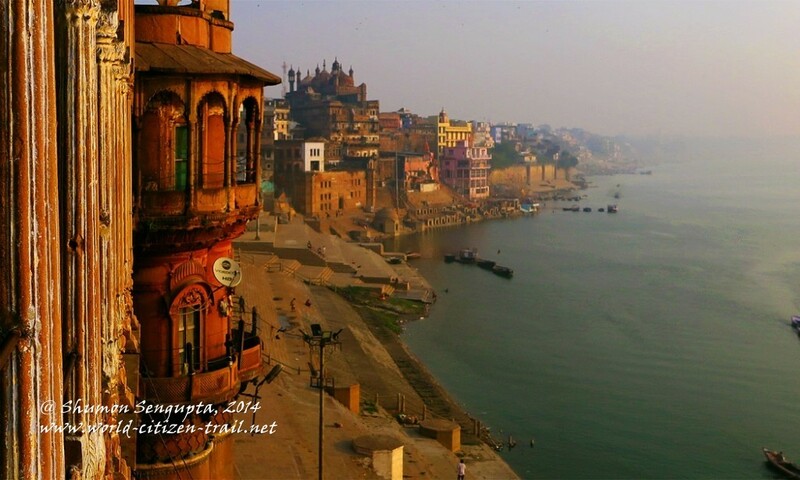 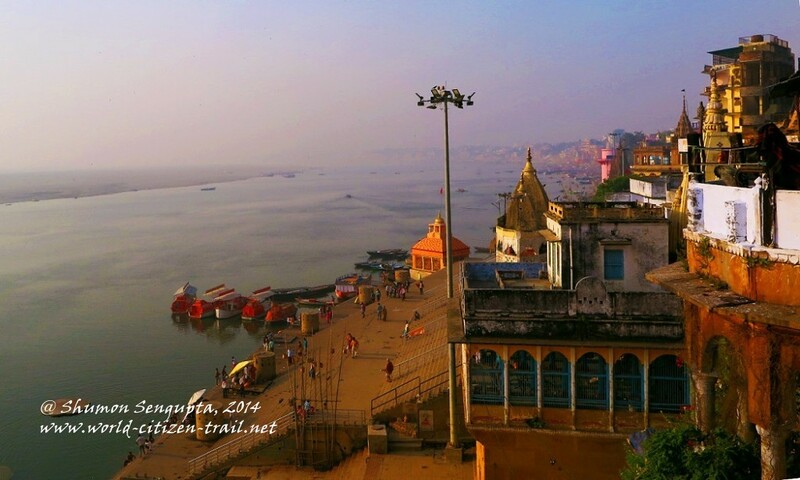 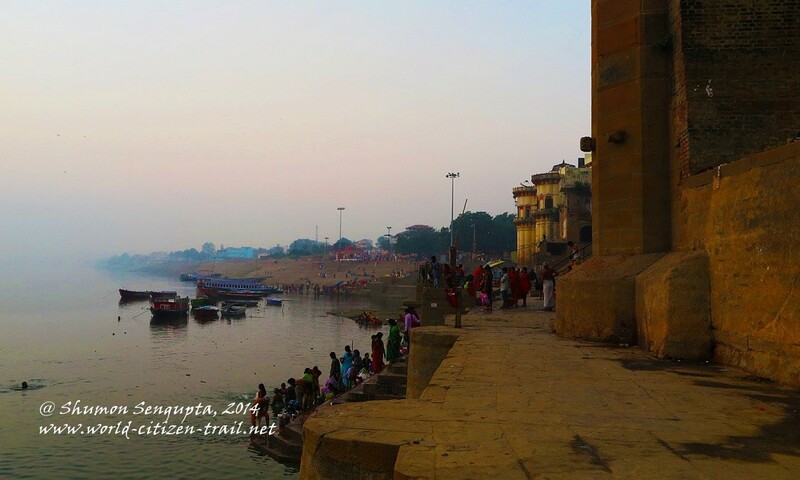 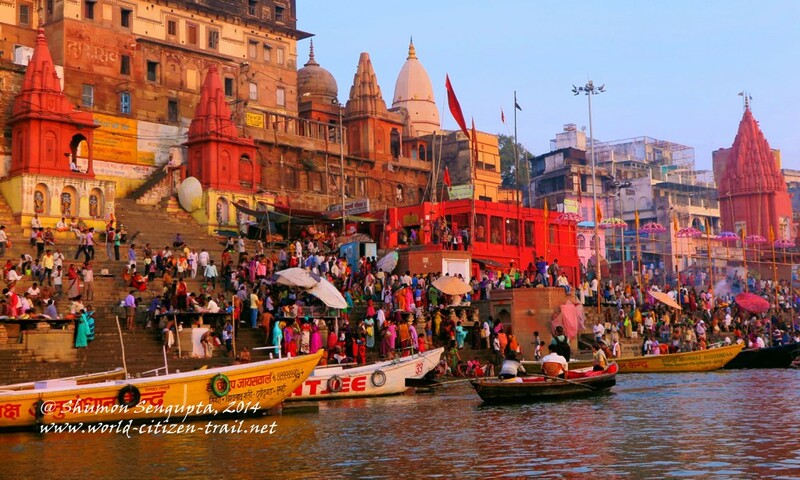 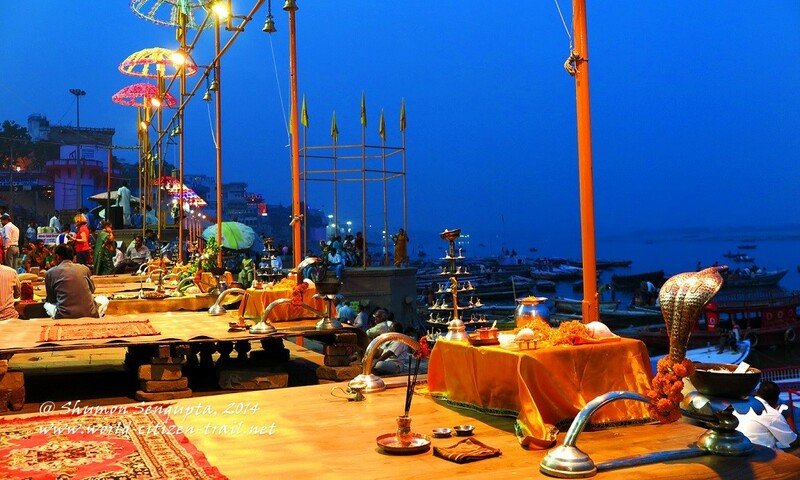 The riverfront of Varanasi is best seen during dawn and sunrise. The sun rises over the right bank, against the ghats on the left bank and throws a brilliant deep orange reflection on the waters. 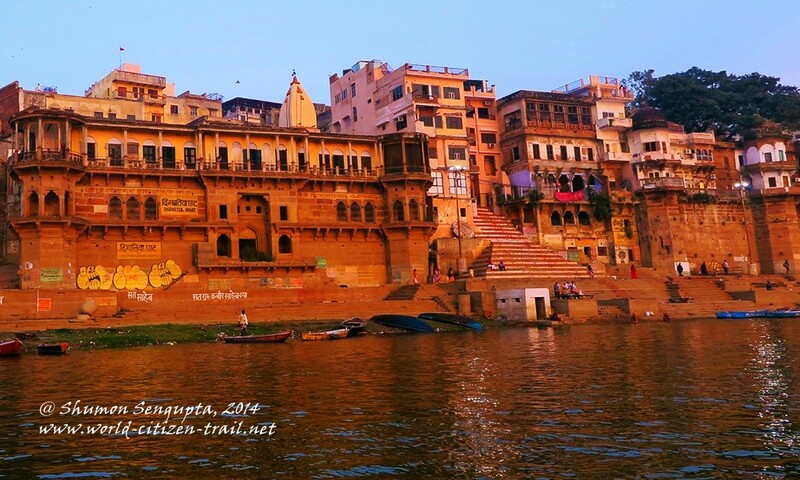 Then, as the sun rises higher, it bathes the high left bank in a golden-yellow hue, throwing deep, shimmering reflections into the river. 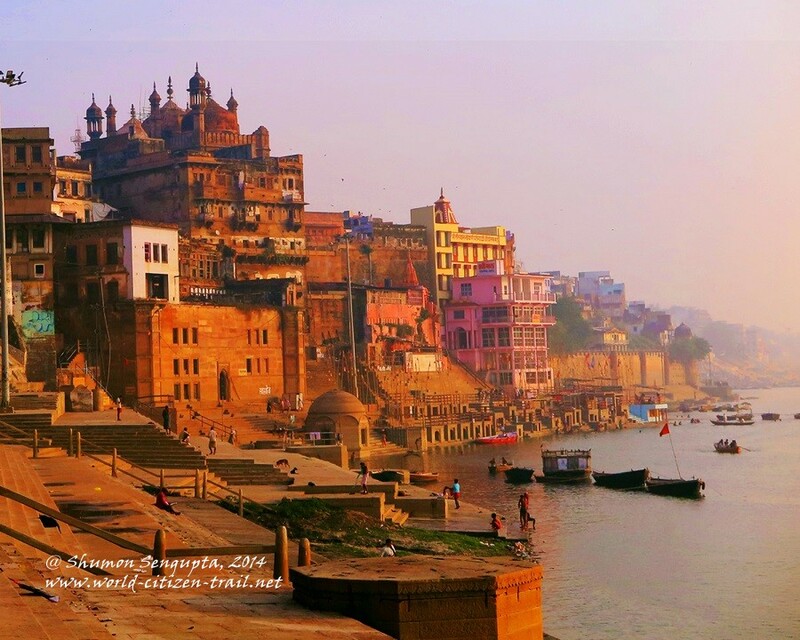 The haze from the rising mist, along with golden-yellow light bouncing off the masonry architecture presents a cavalcade of infinite layers, colors, tones, textures and contrasts – in short a sight of unsurpassed beauty and mystique. 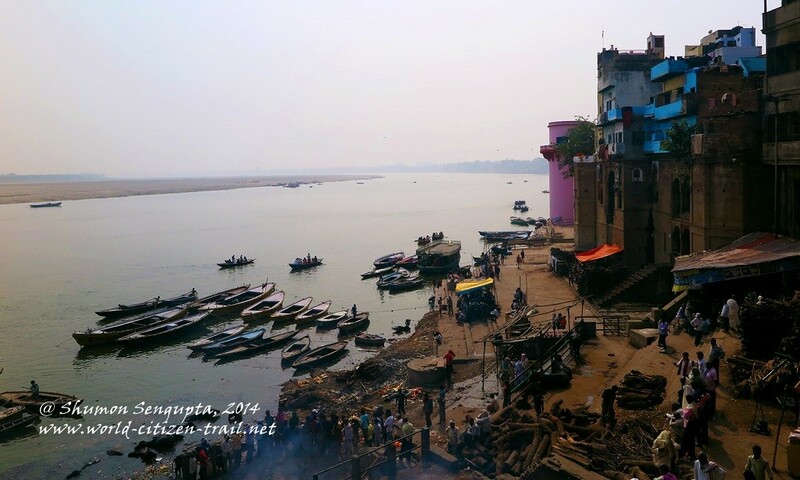 While the unique geography and picturesque beauty of the riverfront in Varanasi hold on their own, it isn’t merely the visual spectacle of a physical space that define the ghats. This ancient riverfront represents a distilled state of the best and the worst of a five millennia old civilization and an ancient and thriving cultural heritage. 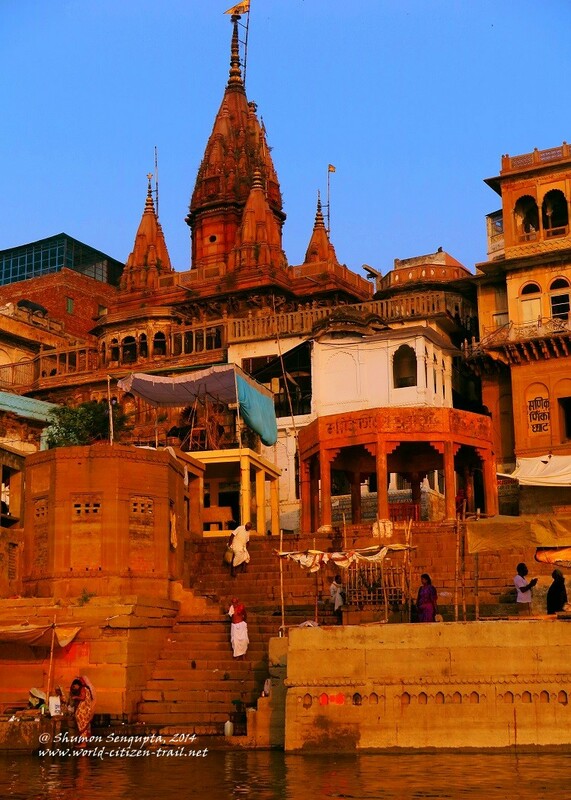 It is a place where material ugliness peeps out amidst overwhelming beauty, where birth, life and death (or after life) are equally celebrated, where human action never seems to stop and time doesn’t seem to move. 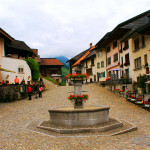 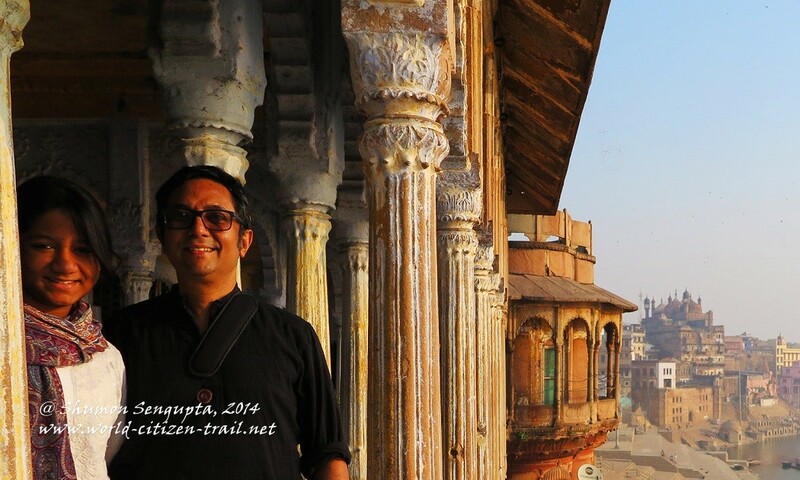 It is a city that has fascinated, challenged and bewildered visitors from across the world, for centuries. 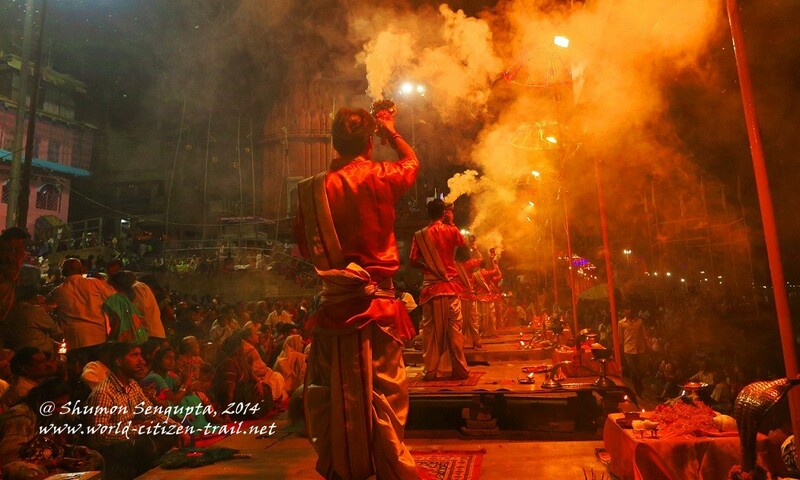 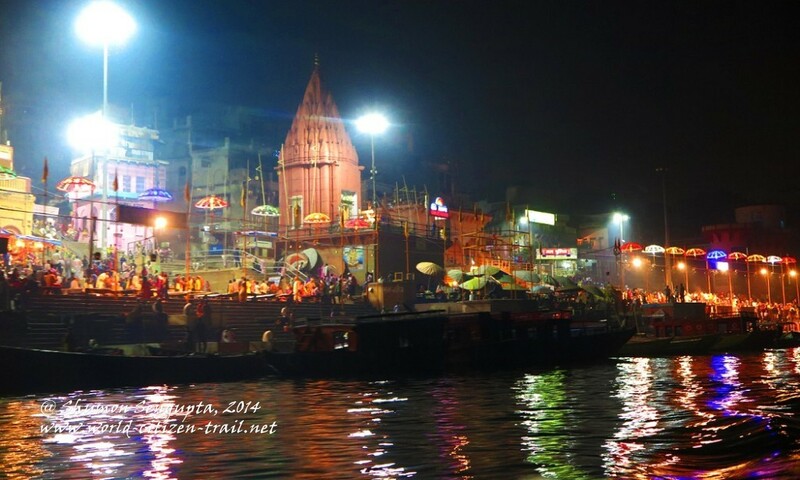 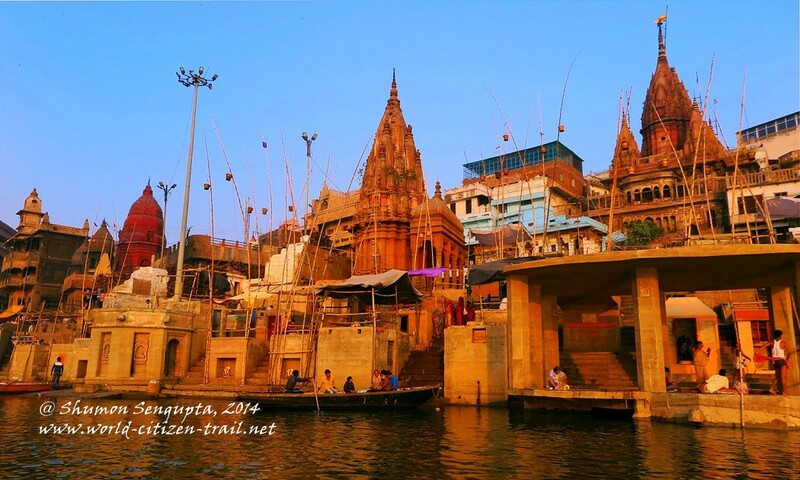 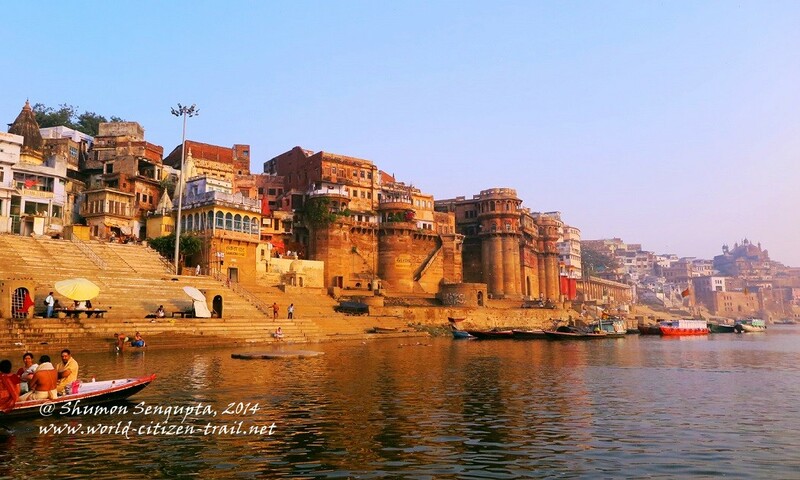 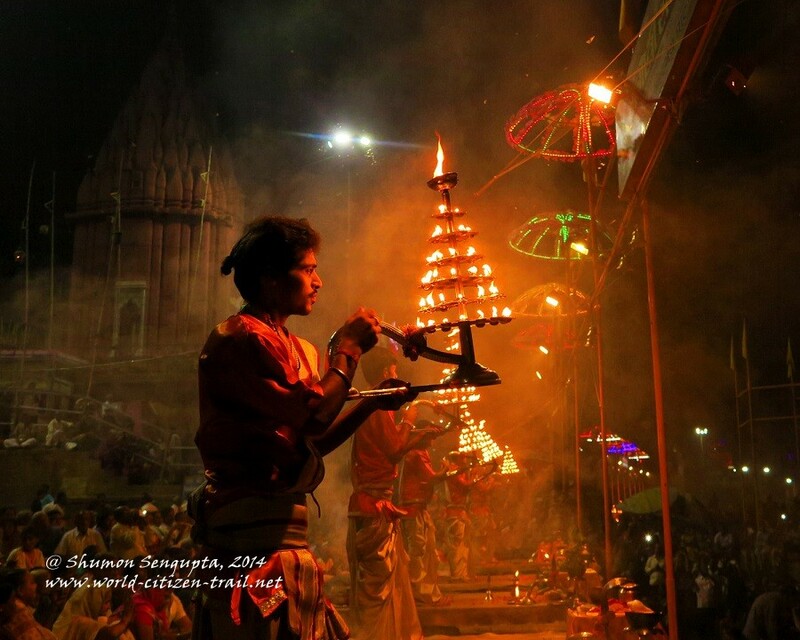 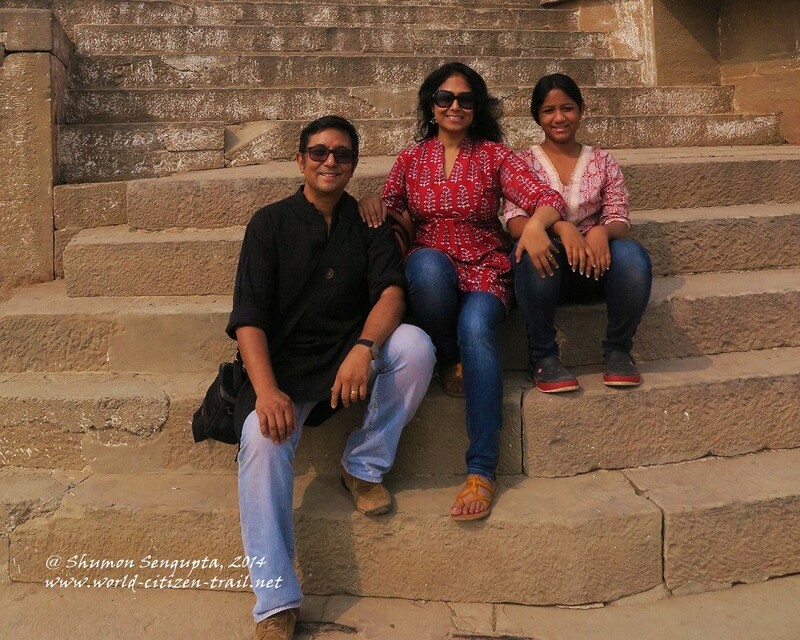 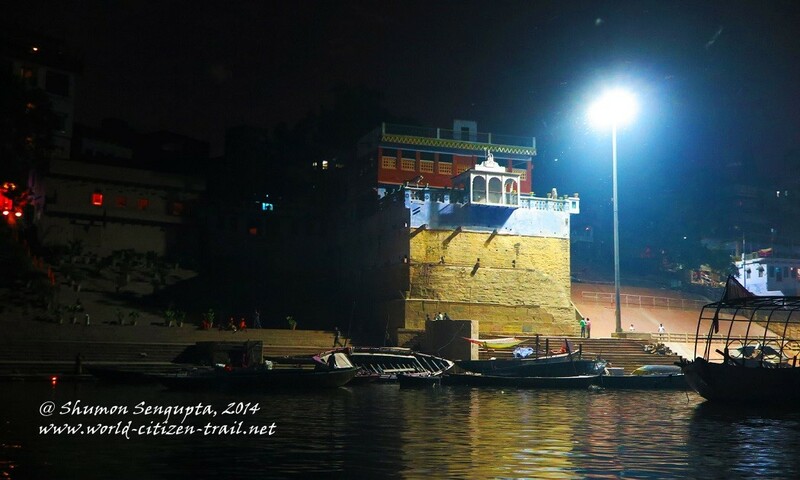 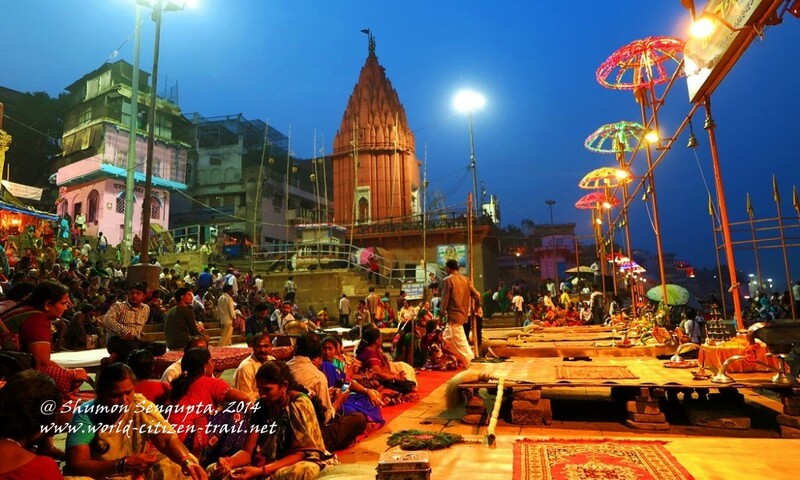 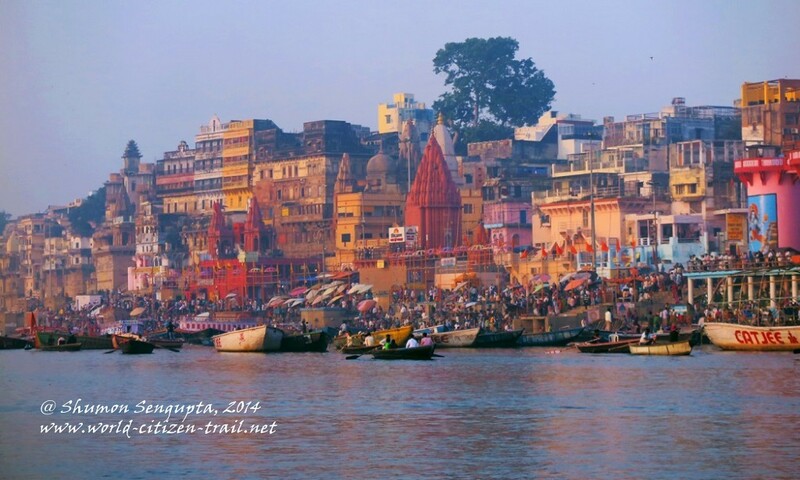 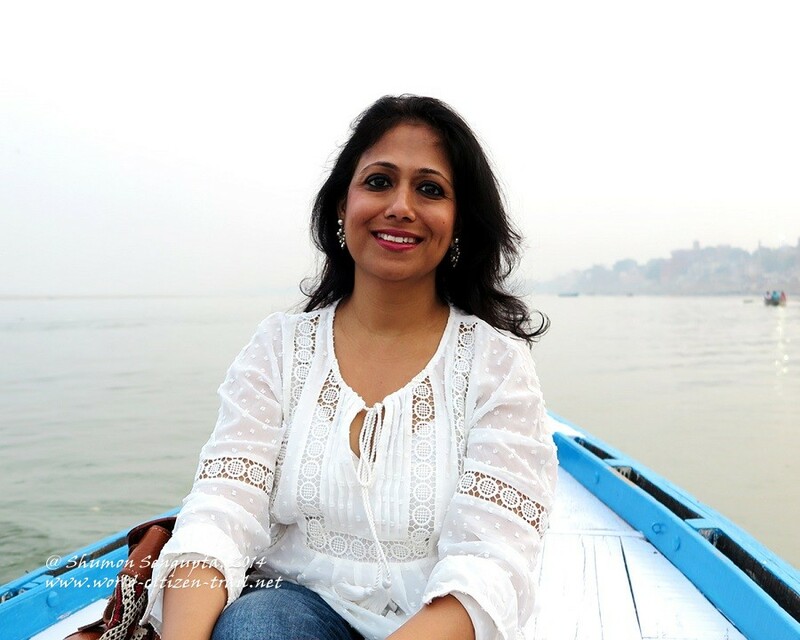 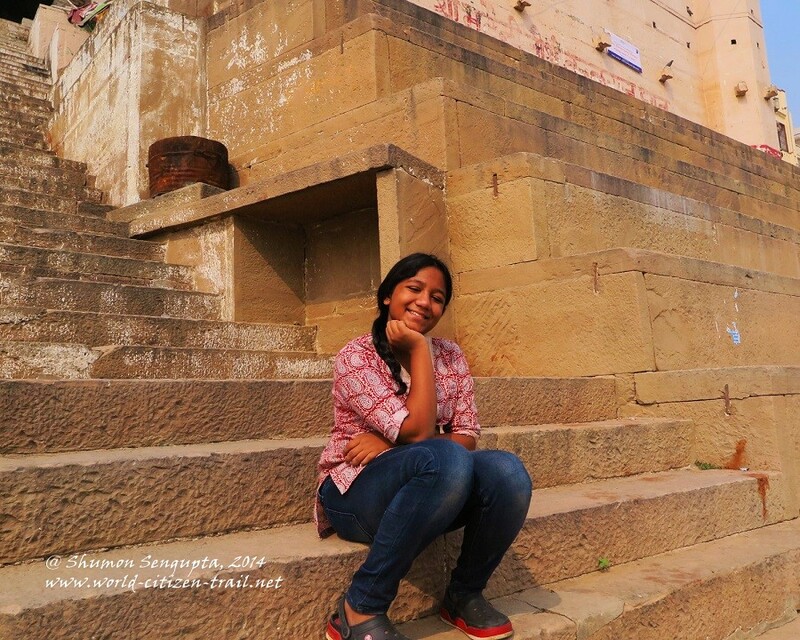 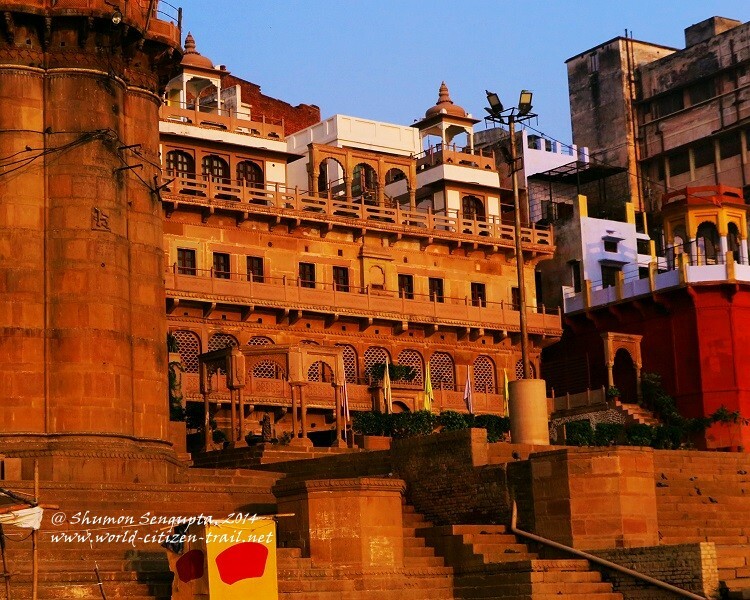 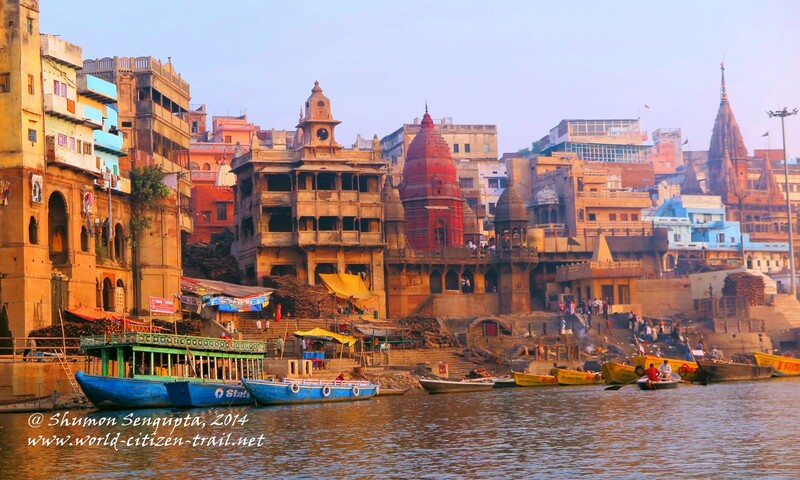 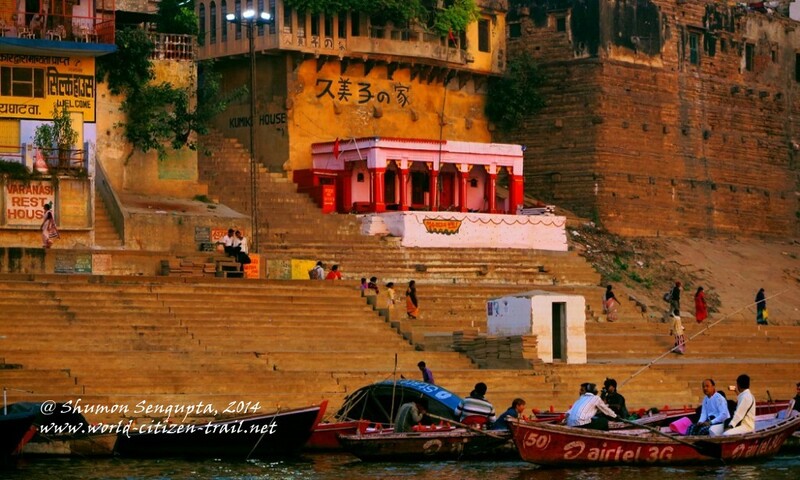 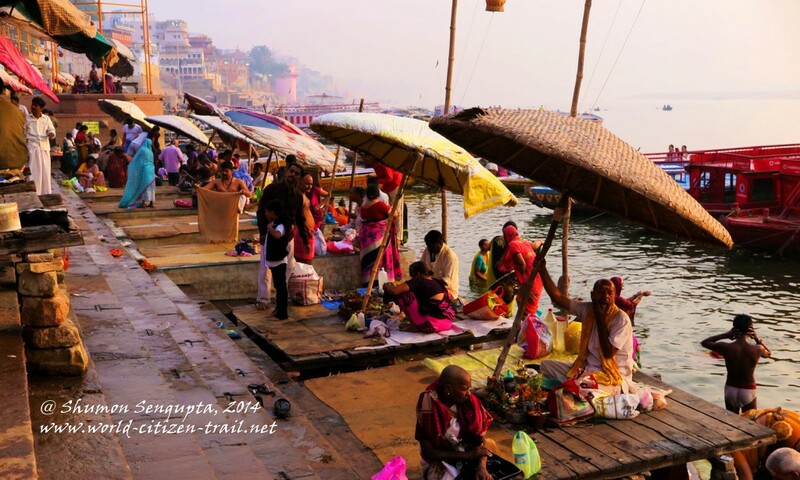 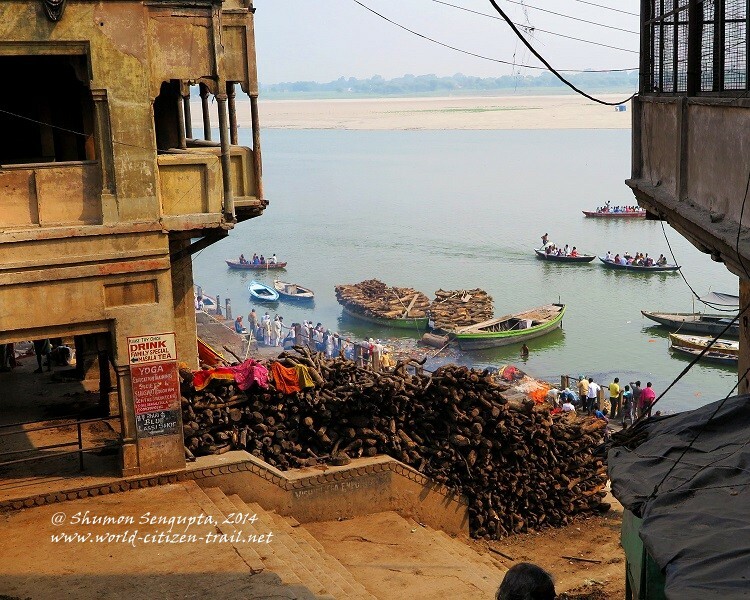 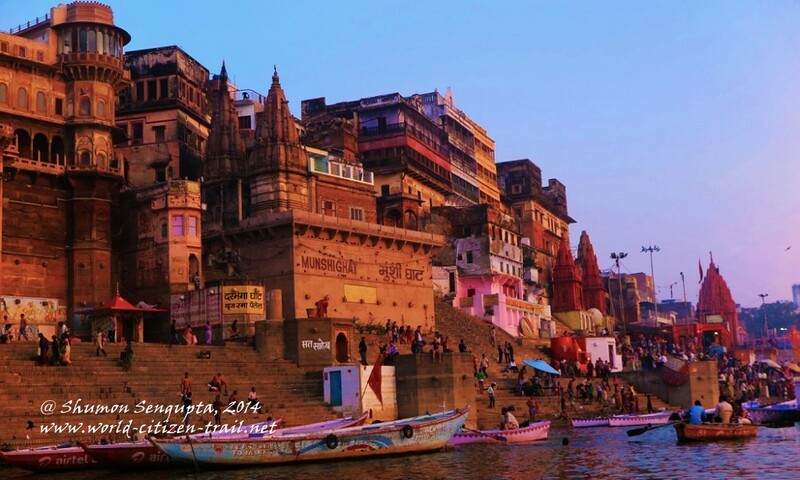 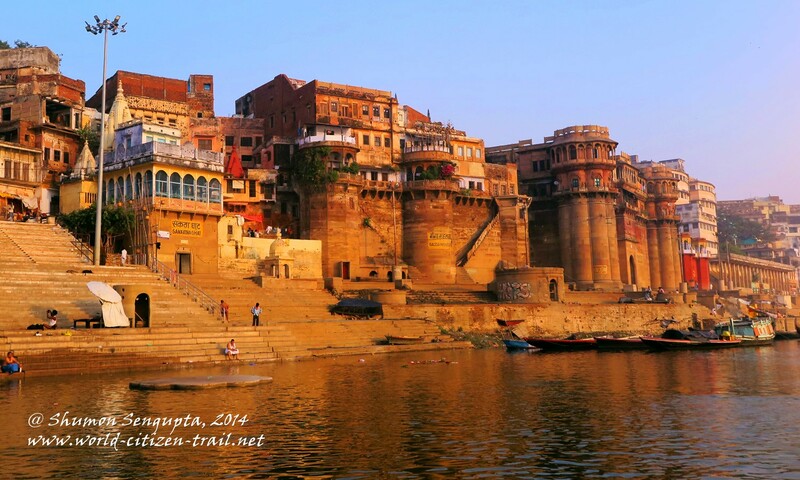 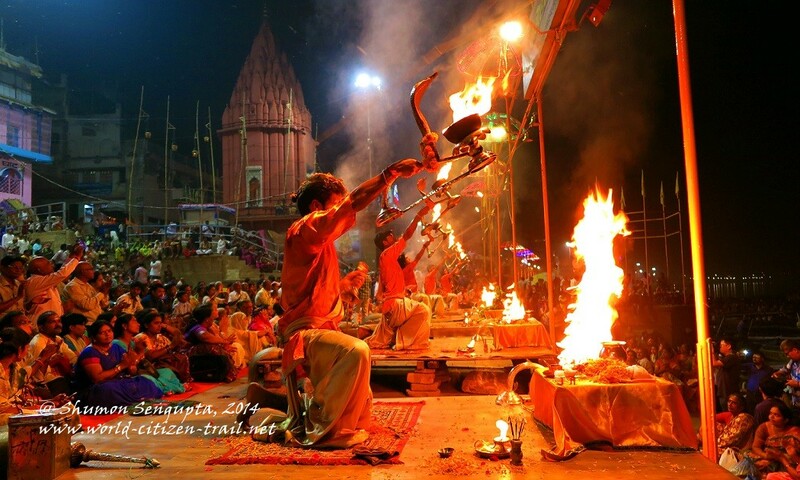 Understandably, the ghats of Varanasi are highly sought after by artists, photographers, poets and philosophers. The riverfront has been captured extensively in camera, as well as in paintings and literature. 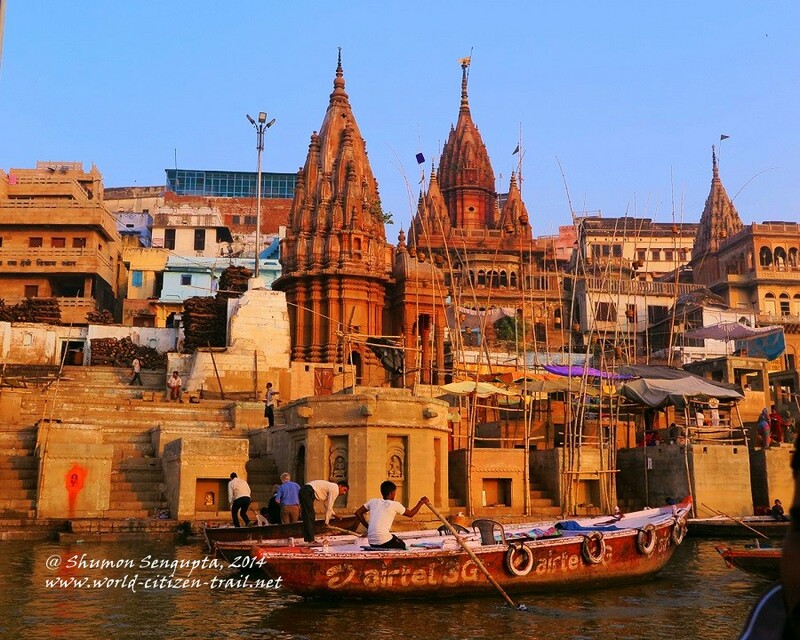 Ustaad Bismillah Khan, the legendary Indian musician and Shehnai Maestro who lived and died in Varanasi was once invited to settle and teach in the USA. 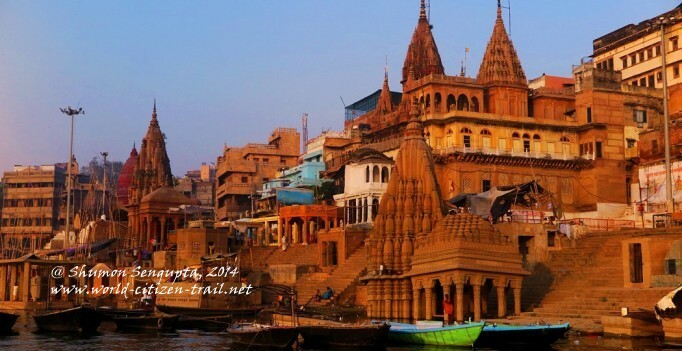 To this generous overture, he is reported to have responded: “Only if Ganga Maiya (Mother Ganges), Baba Biswanath (Lord Shiva, the presiding deity of Varanasi) and Banaras are brought to the United States, will I ever agree to go there and live”. 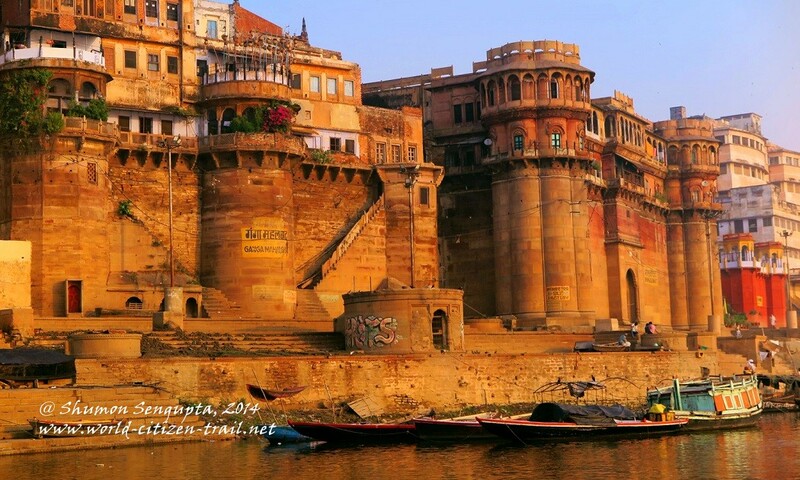 I suppose the maestro said it all for Varanasi.